Eight Years Ago: Gallitzin, Pennsylvania. 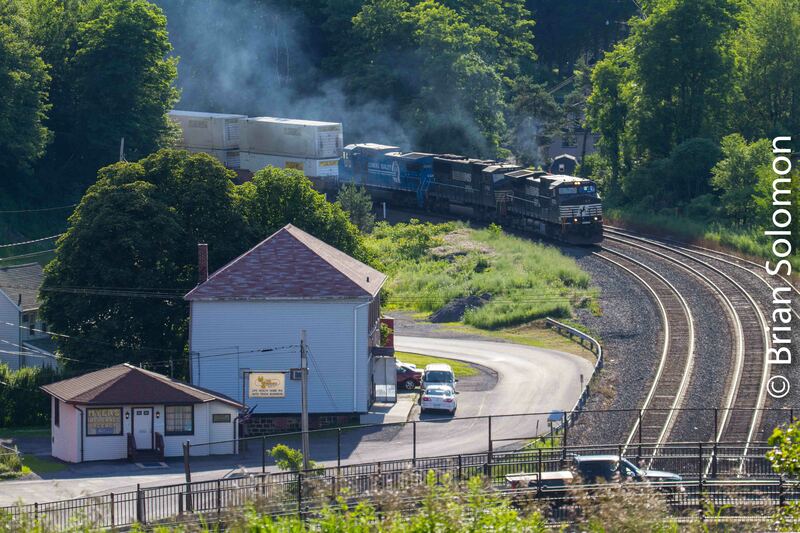 Norfolk Southern 20Q approaches the Allegheny Divide at Gallitzin, Pennsylvania on June 30, 2010. On this day eight years ago, I exposed this photograph of Norfolk Southern eastward intermodal train climbing toward the tunnels at Gallitzin, Pennsylvania. I made this view in the evening of June 30, 2010 using a Canon EOS-7D with 100-400mm autofocus image stabilization lens set at 160mm focal length. Tracking the Light Looks Back: RoadRailers and Position Lights on this day 2010. Norfolk Southern eastward RoadRailer East of Greensburg, Pennsylvania on June 29, 2010. 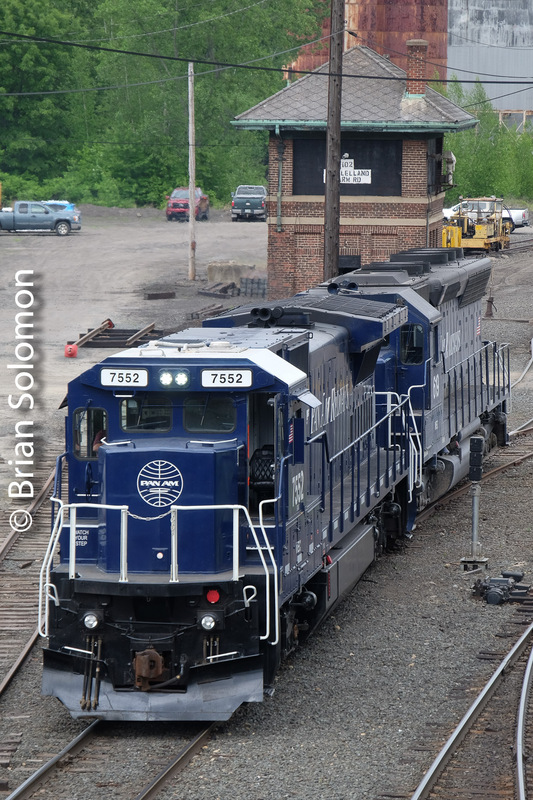 Since these June 29, 2010 photos were made, Norfolk Southern has discontinued its RoadRailer operations in Pennsylvania. Steam era position light signals are on the wane. 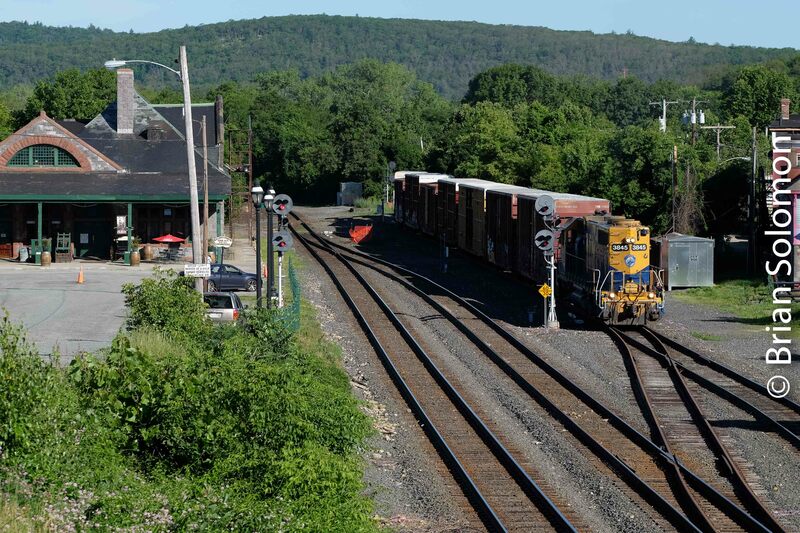 NS has replaced many of its classic Pennsylvania Railroad position lights with modern hardware. So scenes like this one are now doubly rare. 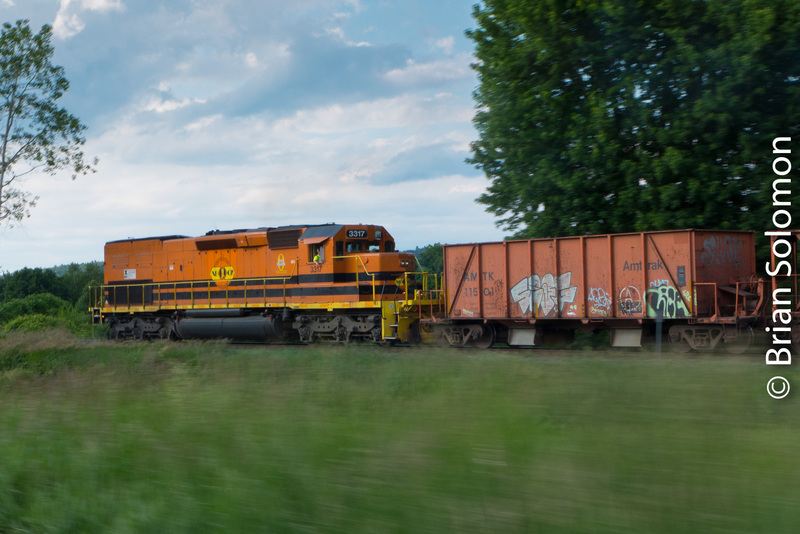 Using my Canon EOS7D, I exposed this sequence of photographs along the former Pennsylvania Railroad Mainline east of Greensburg, Pennsylvania on June 29, 2010. 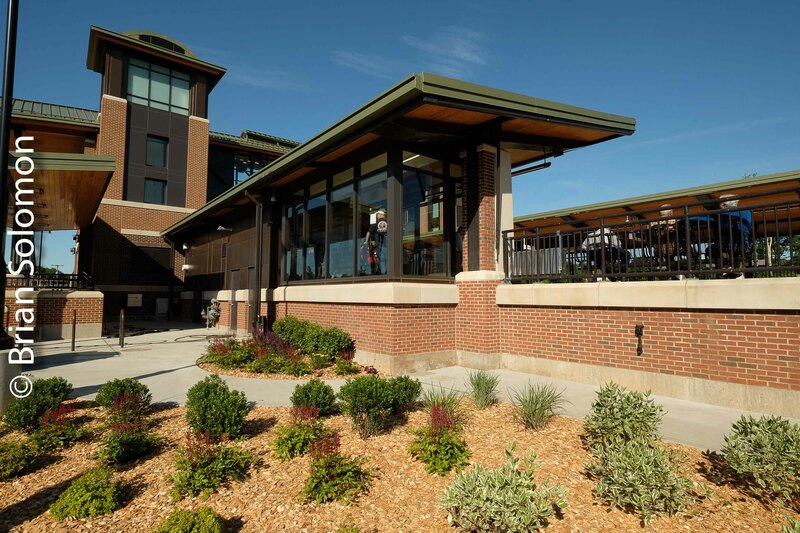 Railroading is about change; and much in these views has changed in the intervening 8 years. Union Pacific on the old Chicago & North Western at Rochelle, Illinois on June 28, 2010. Exposed with a Canon EOS7D at Rochelle, Illinois on June 28, 2010. I was traveling with John Gruber on this day eight years ago, when we stopped at the famous Rochelle, Illinois diamonds to photograph this Union Pacific eastward freight. I opted for a classic view with short telephoto perspective, over the shoulder light, and locomotives framed under the signal bridge. 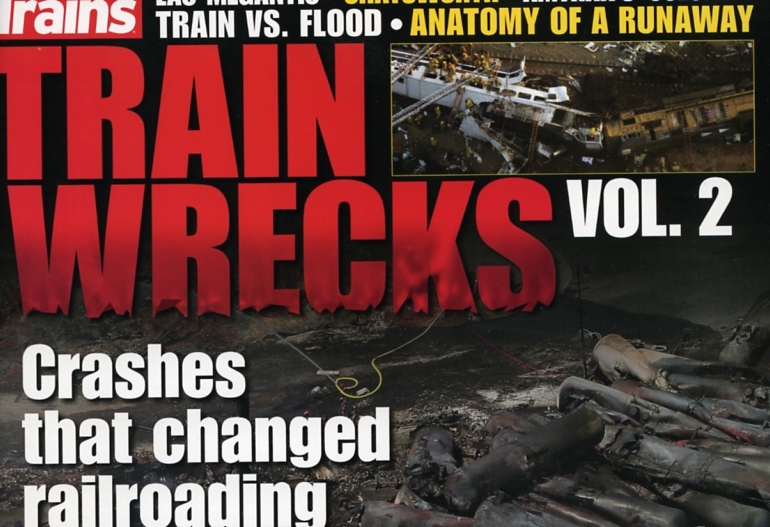 Check out TRAIN Wrecks Vol 2! 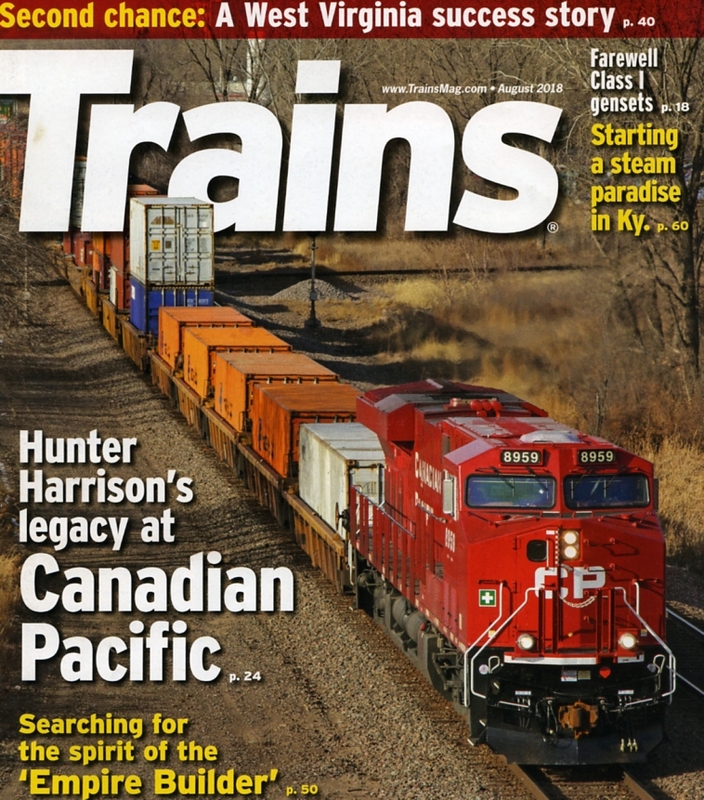 This new special issue of Trains Magazine is now available! 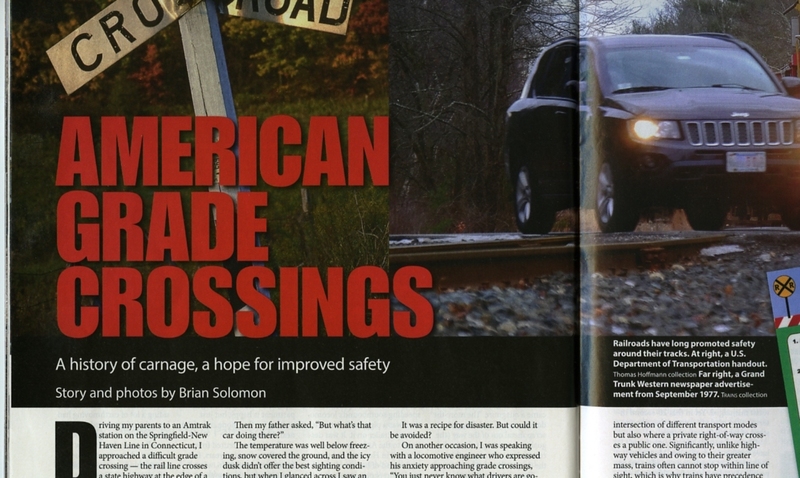 My detailed article on the history of the American grade crossing begins on page 74. Palmer’s Rare Move—June 22, 2018. Here’s the follow up to my June 25thposting Palmer’s Busy Bright Morning [https://wp.me/p2BVuC-5Az]. 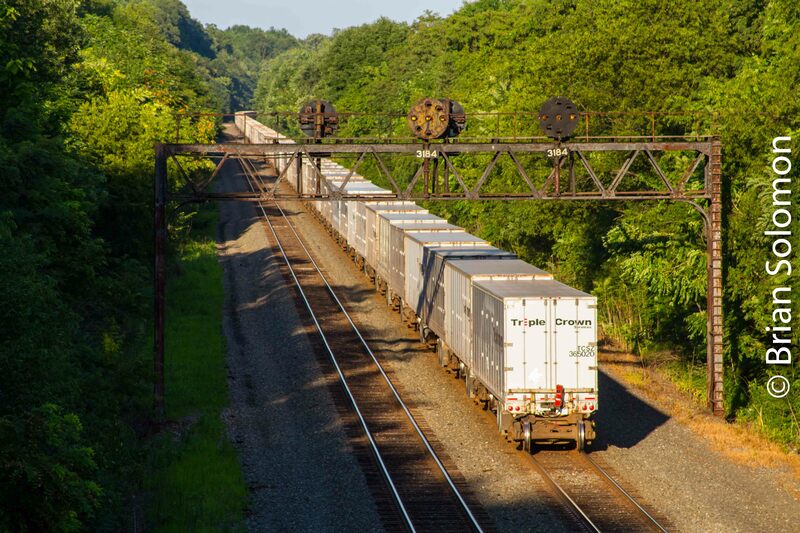 A lone loaded auto-rack was spotted in CSX’s Palmer Yard. CSX’s local freight B740 had arrived from West Springfield Yard. B740’s crew discussed arrangements with the dispatcher to reverse out of the yard (westward) with the auto-rack on the interchange track and then pull forward onto the controlled siding at CP83. CSX B740 shoves back on the interchange track at Palmer, Massachusetts. 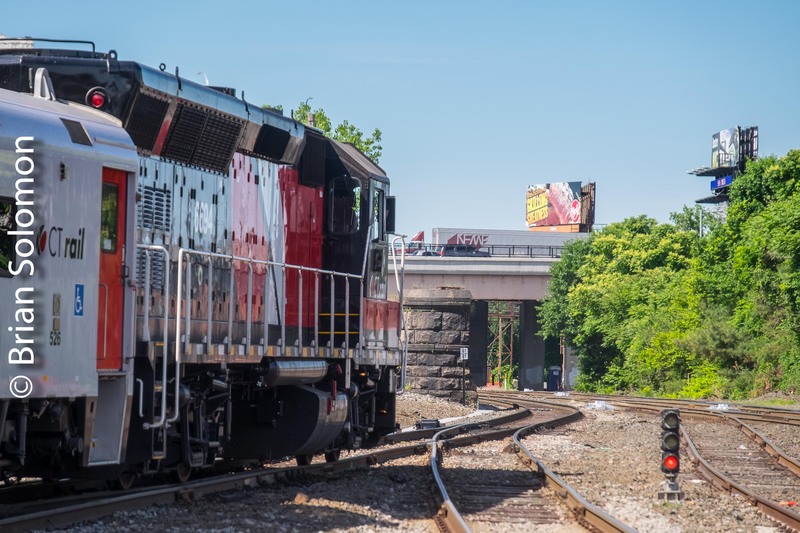 The reason for this was to avoid using the normal freight connection from the controlled siding into the yard because of the length of the auto rack was at risk of derailing over the tight switches. 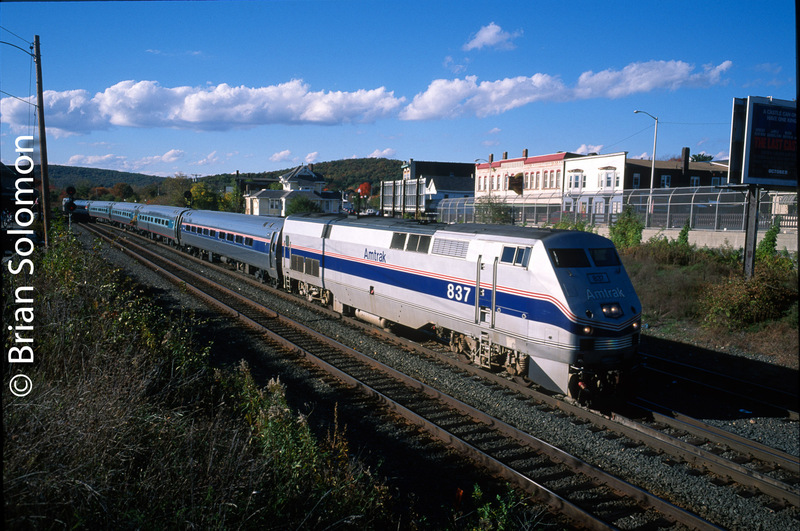 The crossover at CP83 from the interchange track to the controlled siding was installed in 1995 to facilitate Amtrak’s Vermonter, which was then operating via Palmer and changed directions here to go between CSX and New England Central’s route on its Springfield, Massachusetts-St Albans, Vermont portion of the run. 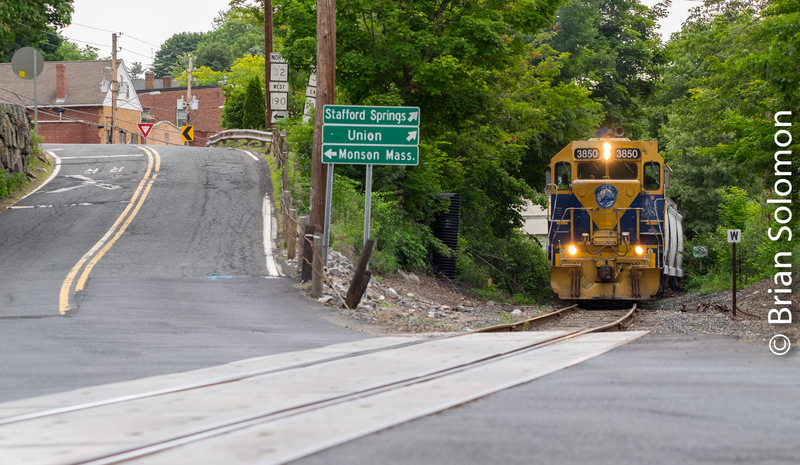 The passenger crossover at CP83 has been rarely used, since Amtrak’s Vermont returned to the more direct routing in December 2014 (running north of Springfield on the Boston & Maine Connecticut River line via Greenfield to East Northfield). 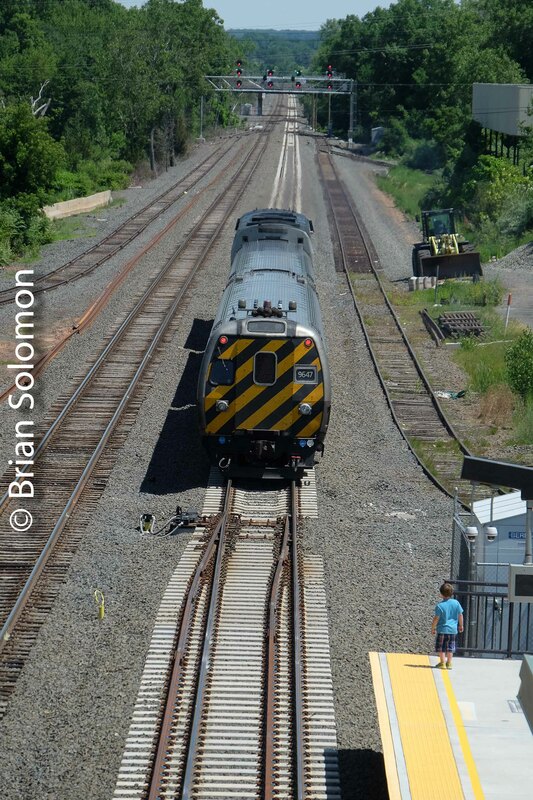 CSX’s crewman lines the switch for the controlled siding on the now rarely used crossover. Notice the rust on the rail. 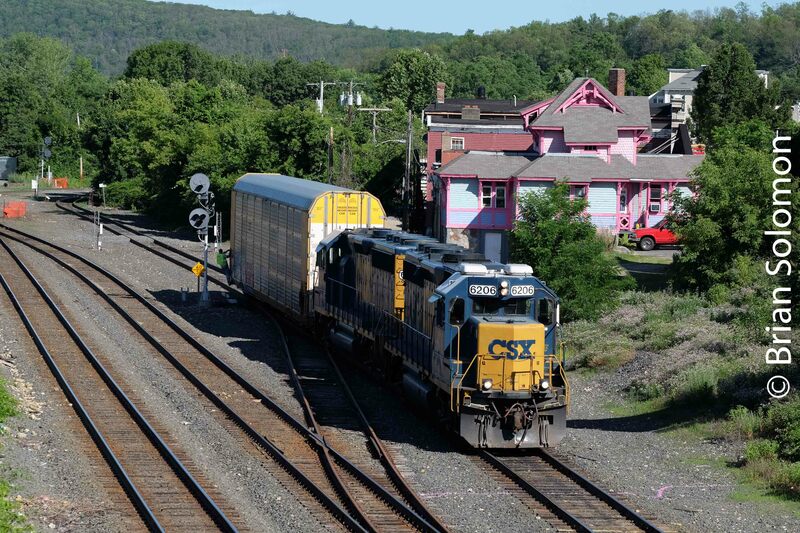 CSX B740 pulls forward through the crossover and will soon head east on the Boston & Albany to East Brookfield. 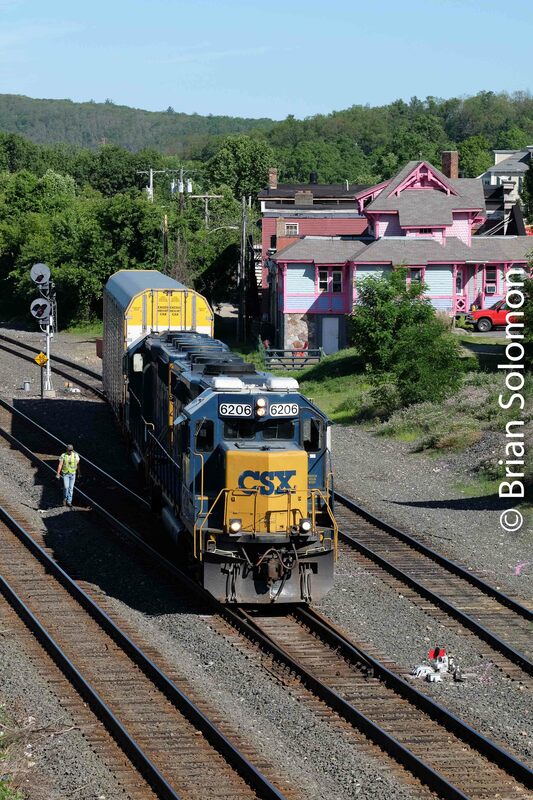 Notice how the CSX crewman on the ground is illuminated by the sun shinning through the gap between the locomotives and the auto rack. It was a fortuitous situation to catch this rare move in nice morning sun. 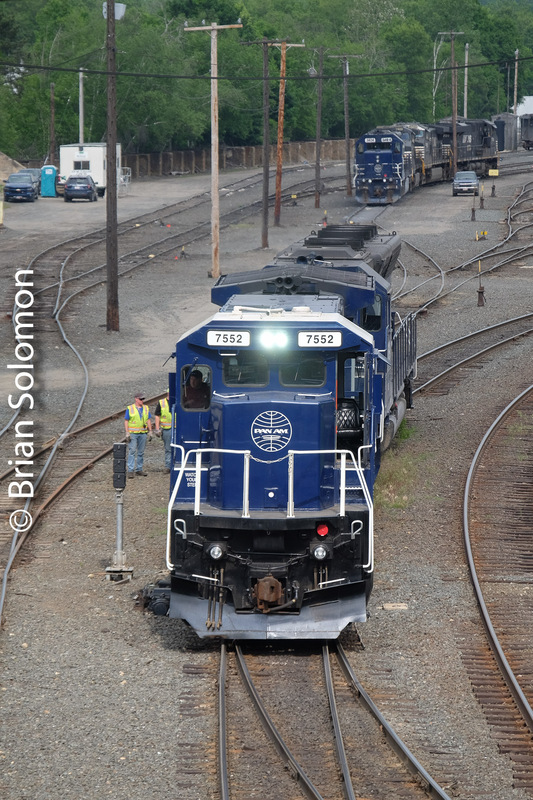 B740 then continued east to East Brookfield, where CSX autoracks are unloaded on the East Brookfield & Spencer. 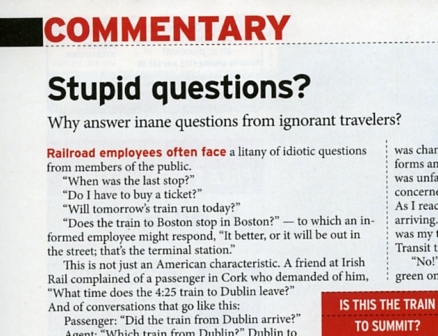 August Trains Magazine: Stupid Questions? My author’s advance copy of the August 2018 Trains Magazine has arrived. 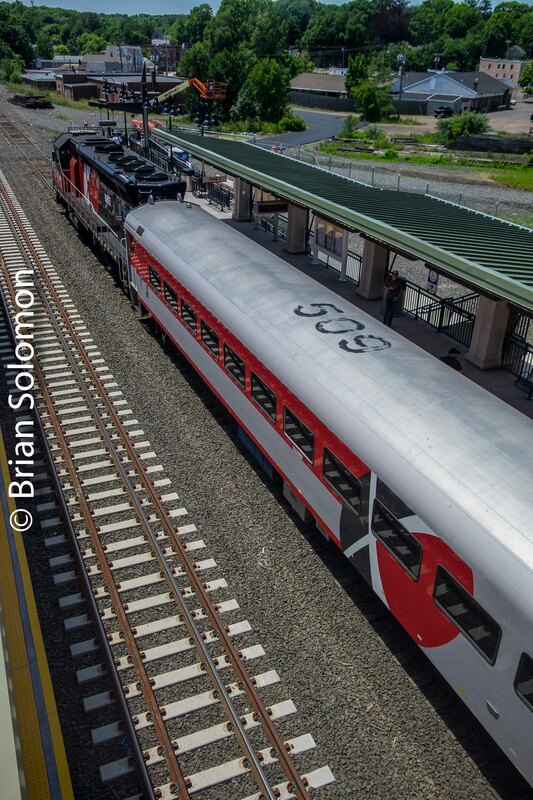 Here’s the cover of August 2018 Trains—photo by Steve Glischinski. My article is on pages 16-17. I illustrated this editorial with a photograph I made at New York City’s Grand Central Terminal. June 26, 2010—Eight Years Ago Today at Steward, Illinois. 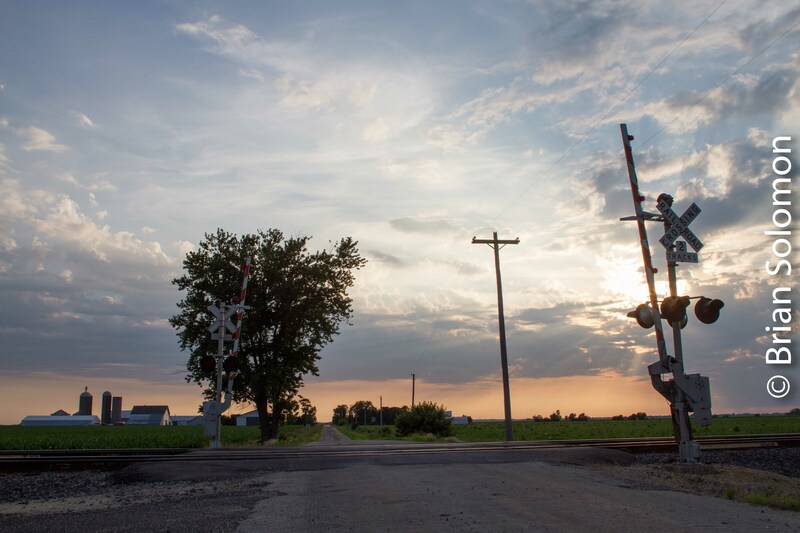 Sunset on BNSF’s old C&I Sub at Steward, Illinois June 26, 2010. I exposed this sunset view using my Canon EOS7D eight years ago today (June 26, 2010). To allow for more visible detail in highlight and shadow areas I adjusted the camera RAW file using Lightroom and scaled the output for internet presentation. Tracking the Light is on AUTO PILOT Today. 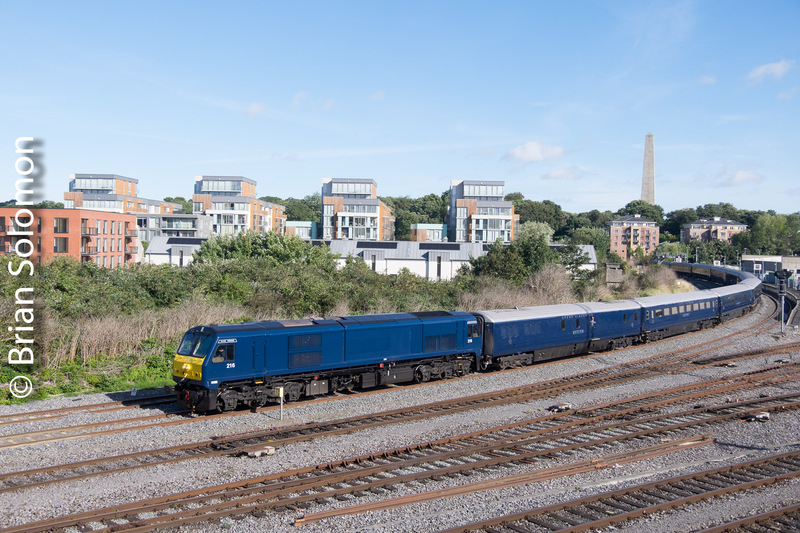 Navy Blue—Irish Rail 216 for Belmond’s Grand Hibernian. 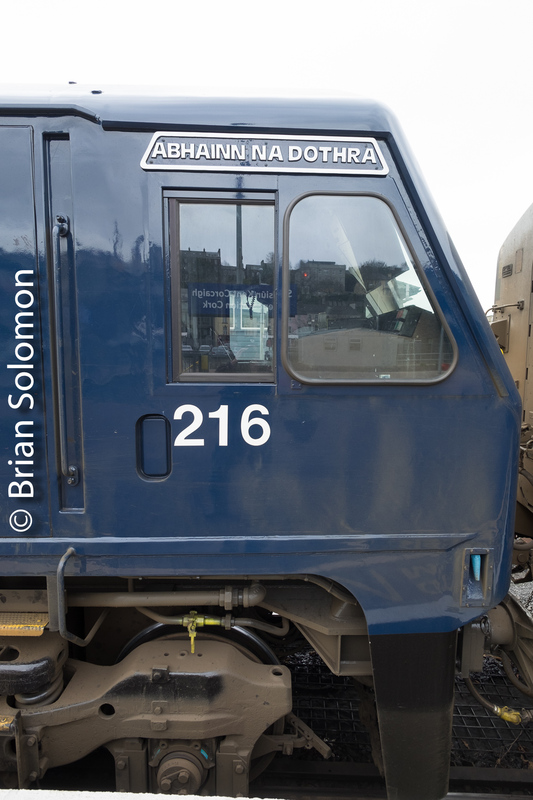 In my earlier 216 post I pictured Irish Rail 216 in its ordinary paint liveries, before it was specially adorned for service on the Belmond Grand Hibernian cruise train in 2016. This post features 216 in fancy dress. Off season, 216 will work other services. 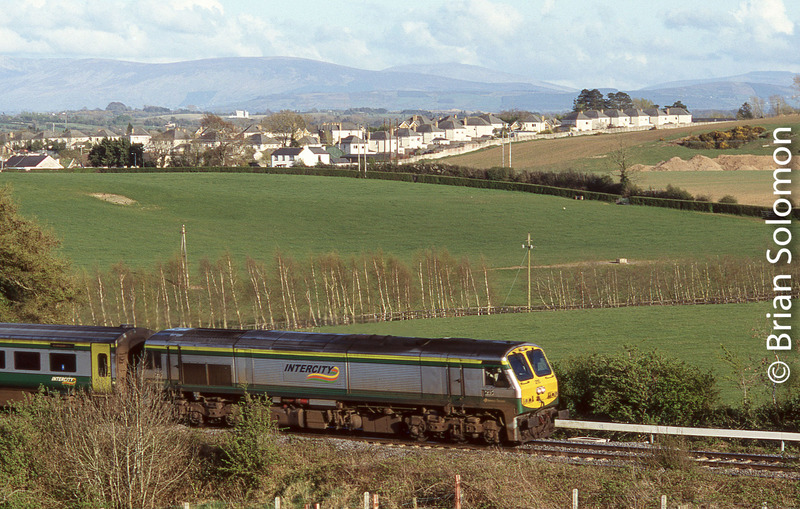 It is seen arriving at Kent Station in Cork with a Mark4 set from Dublin. 216 looks best on a bright sunny day. The slightest change in colour balance will dramatically alter the tint of Belmond’s navy, making this train unusually challenging to picture accurately. 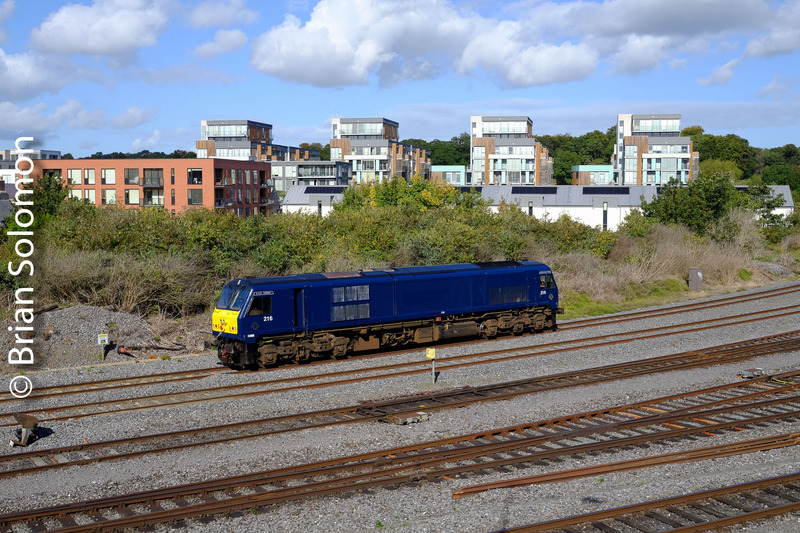 It is seen passing Islandbridge on a sunny Sunday morning. 216 up close. Unfortunately the navy colour tends to show dirt and grime more readily than other liveries. I wonder, with all the attention now paid to 216, has this become the most pictured of the 201 class diesels? The Grand Hibernian is among the trains featured in my book: Brian Solomon’s Railway Guide to Europe, now available from the Kalmbach Hobby Store. Pittsburgh & Lake Erie Coal Train: Saving a Sunset Chrome. 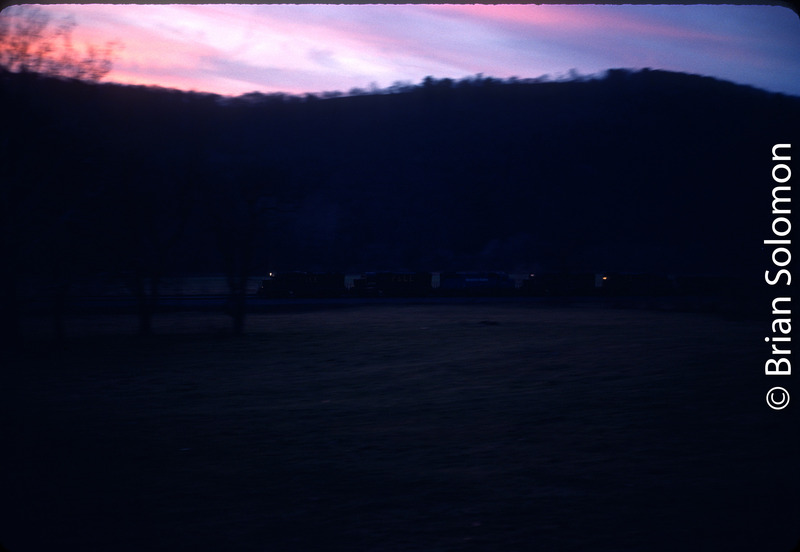 On November 15, 1987, I followed a loaded PLMT coal train east from Buffalo, New York. 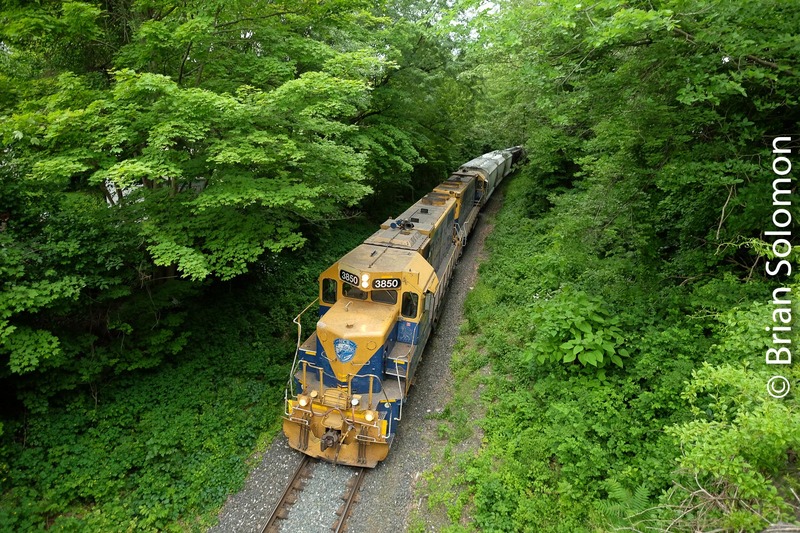 This train had operated with Pittsburgh & Lake Erie locomotives and was being handled by Guilford’s Delaware & Hudson via trackage rights over Conrail’s former Erie Railroad. Try to fit all that on the slide mount! At the time these coal trains operated about once a week, and while it wasn’t uncommon to find P&LE locomotives, catching the trains on film was challenging. I made this view on Kodachrome 25 with my Leica M2 with 50mm Summicron Lens. 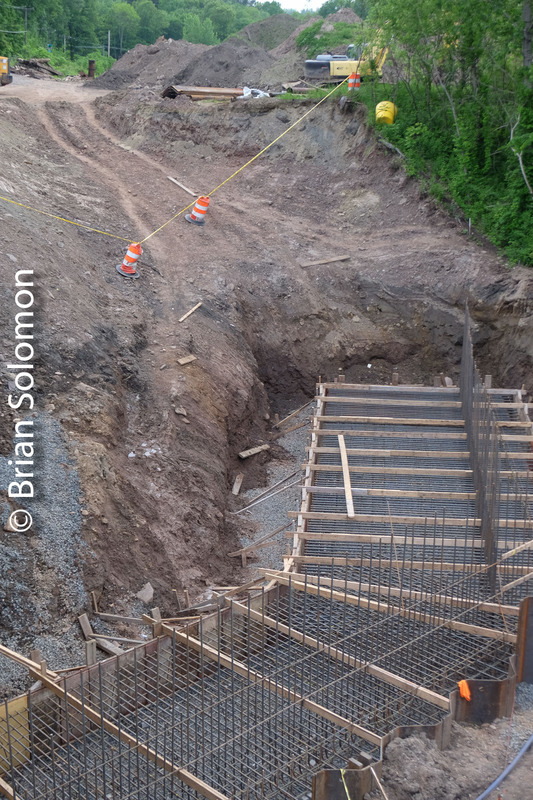 It’s a badly under exposed long pan (about 1/8 of a second) from a hillside off the Canisteo River Road, in the valley of that name, a few miles east of Adrian. The original slide was made at the very end of daylight, and the slow speed ISO25 film didn’t give me the needed sensitivity to capture the scene with adequate exposure. That’s a long way of saying; it was dark and I underexposed the film. Here’s the scaled, but unadjusted scan. It’s about 3 to 4 stops underexposed. The slide is nearly opaque except for the sky. Exposure was about f2.0 at 1/8 second on Kodachrome 25 (ISO 25). Thankfully, I didn’t through the slide away. I scanned it using VueScan 9×64 (edition 9.6.09) software and a Nikon Super Coolscan 5000 slide scanner. It opted for manual controls; I selected 4000 dpi input, under ‘color’ I used the Kodachrome K14 color profile, and while output was set at 4000 dpi as a TIF file. I then imported the TIF into Lightroom for color, exposure and contrast adjustment, necessary to compensate for my extreme underexposure. To hold sky detail, I applied a digital graduated neutral density filter. Here’s my first round of adjustments. I thought the sky and overall color balance seemed a bit otherworldly so I zeroed out the adjustments and started again. Compare this with the image below. Although similar, this version is better balanced and looks closer to the original scene. Although underexposed, the Kodachrome film was able to capture some detail over more than 6 stops, allowing for post processing adjustment. 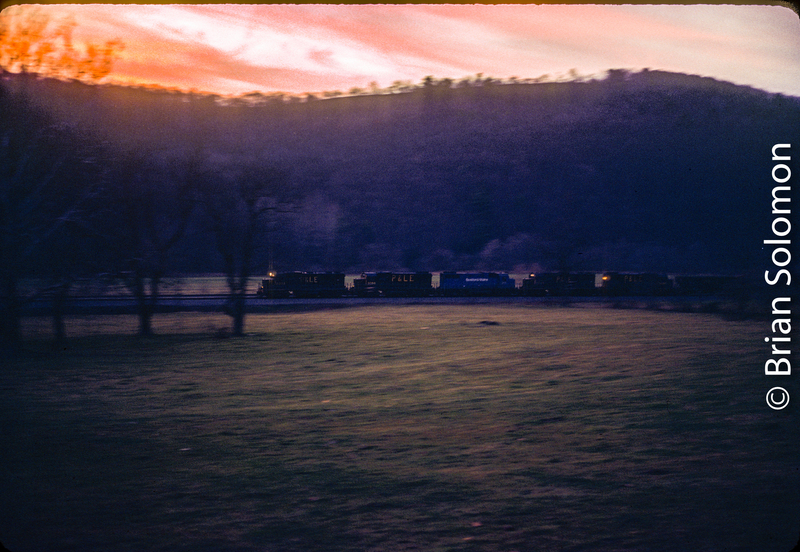 Although slightly grainy, the results are much improved over the original and captures my intended effect of the train rolling at speed through the Canisteo Valley at dusk. 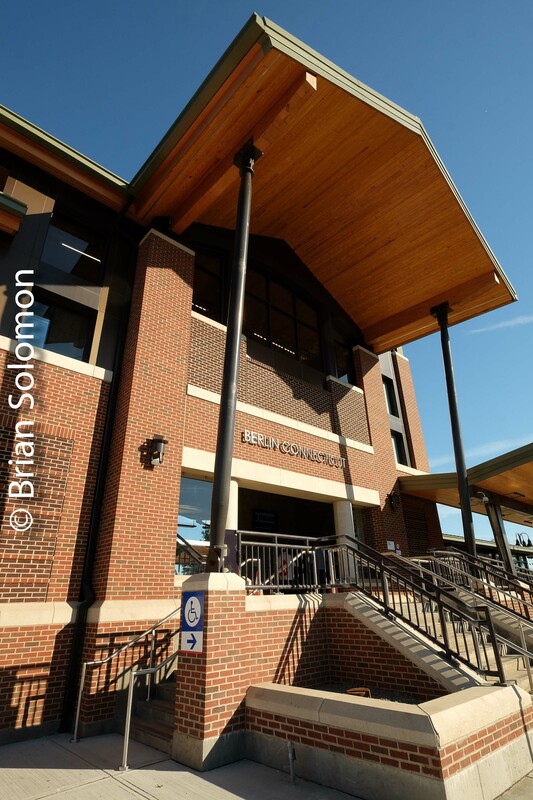 TEN photos: All-New Berlin Station—Connecticut, that is! 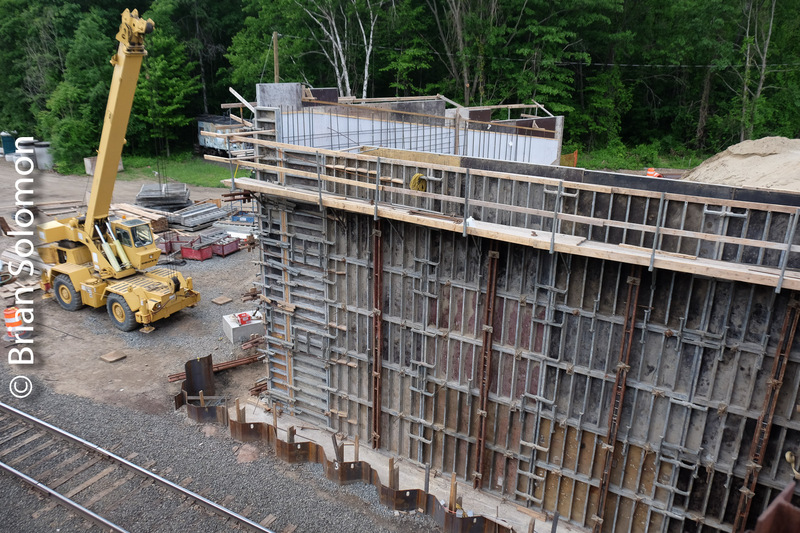 There’s little left to remind you of the historic building that once served passengers at Berlin, Connecticut. 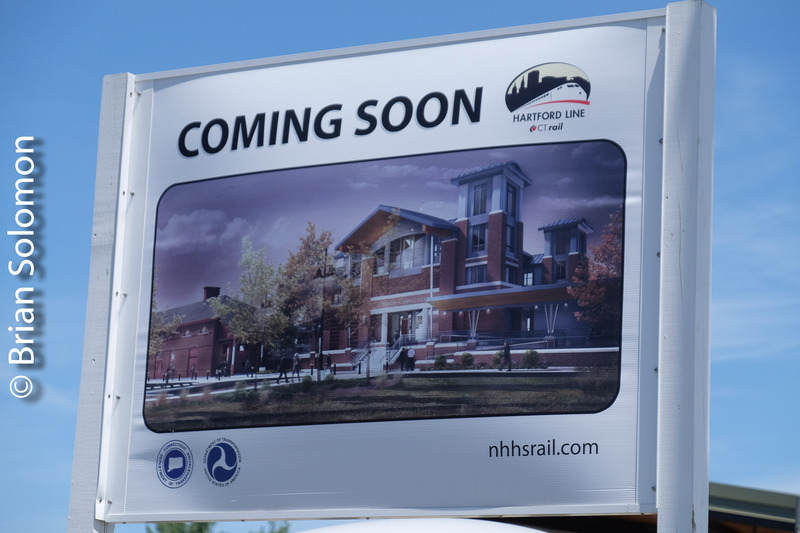 In December 2016, during construction of the modern building, the historic New Haven Railroad station was suspiciously destroyed in a fire. An artist vision of the proposed integration of the old station with the modern structures. It was not to be. Last weekend was my first visit to the new station. This features some impressive looking architecture, elevators and a high glass enclosed footbridge. Morning light on the impressive entrance to the new station. Exposed using a FujiFilm X-T1 with 12mm Zeiss lens. However, it seems to be notably lacking a proper waiting room where passengers can get out of the elements, and features only a ‘portapot’ in place of proper toilets. In place of our friendly ticket agent, there’s a modern CT rail ticket machine to dispense tickets. You can buy your Amtrak ticket on-line, over the phone, or using an App on your smart-phone. Also on the ‘plus side’ the station is well suited to photography and will make for a nice place to board and photograph trains. 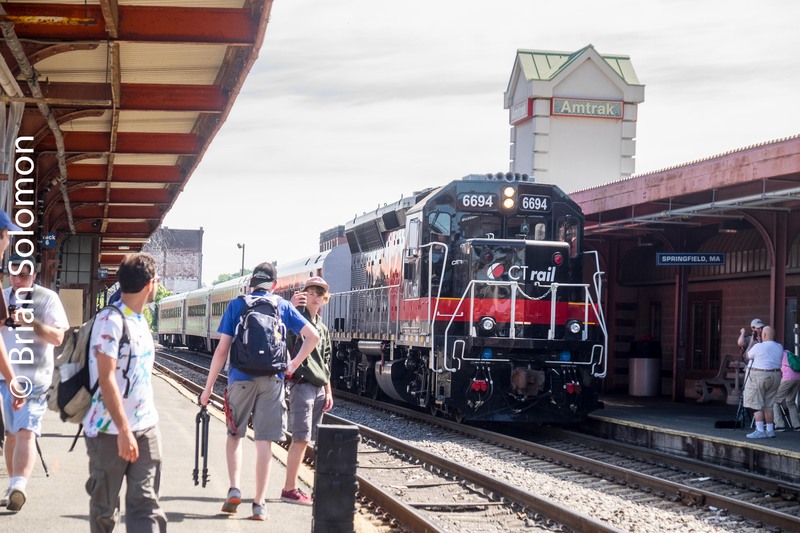 Also, with the expanded Amtrak service and new CT rail Hartford Line trains, there’s more service than there has been in many years. The east-side platform looking south toward New Haven, Connecticut at 8am. Exposed using a FujiFilm X-T1 with 12mm Zeiss lens. Exposed using a FujiFilm X-T1 with 12mm Zeiss lens. CT rail 6400 making its stop at Berlin, bound for Springfield, Massachusetts. Exposed using a FujiFilm X-T1 with 12mm Zeiss lens. Amtrak 405 to New Haven. Exposed using a FujiFilm X-T1 with 12mm Zeiss lens. Amtrak 461 heading toward New Haven at midday is about to depart Berlin. All aboard! Exposed using a FujiFilm X-T1 with 18-135mm Fujinon lens. Connecticut Trolley Museum at Warehouse Point. 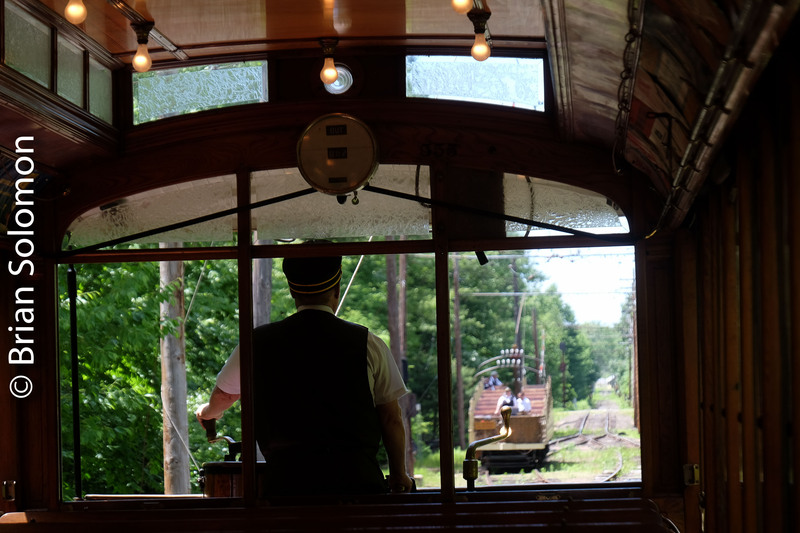 For more than forty years my family has been visiting the Connecticut Trolley Museum at Warehouse Point in East Windsor. I made these views last weekend. 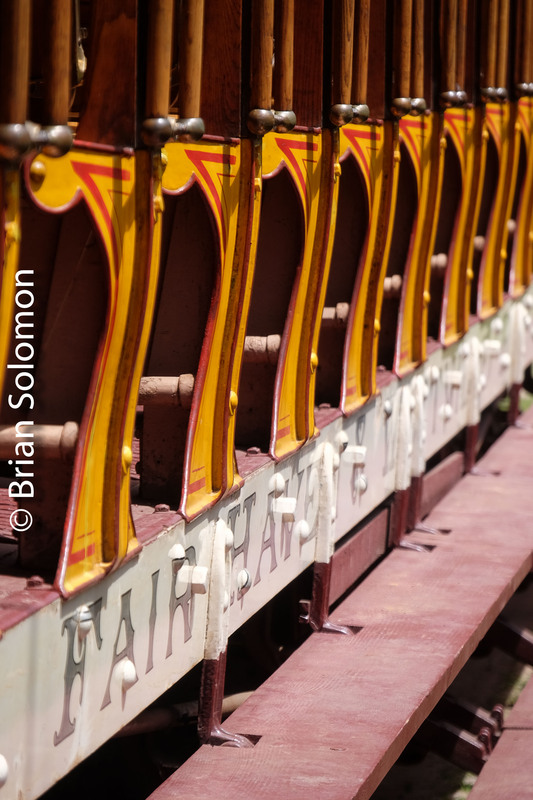 I’ve always enjoyed the nostalgia of the trolleys and the leisurely ride through the forest. 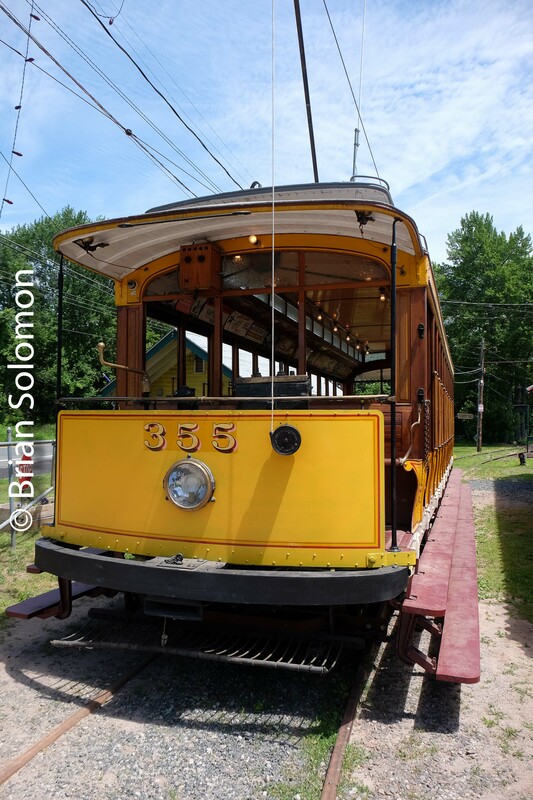 What’s interesting is that the trolleys I knew as a kid are largely inside and pending restoration, while today’s operable cars were largely out of service when I was younger. These views were exposed using my FujiFilm X-T1. Irish Rail 216 in Ordinary Dress. Today, Irish Rail 216 wears a one of a kind navy-blue livery and is seasonally assigned to Belmond’s luxury Grand Hiberniancruise train. This has become one of the most popular trains to photograph in Ireland and I’ve caught it here and there over the last few years. For my 201 retrospective, I thought I’d present a few photos of 216 before it was blue. 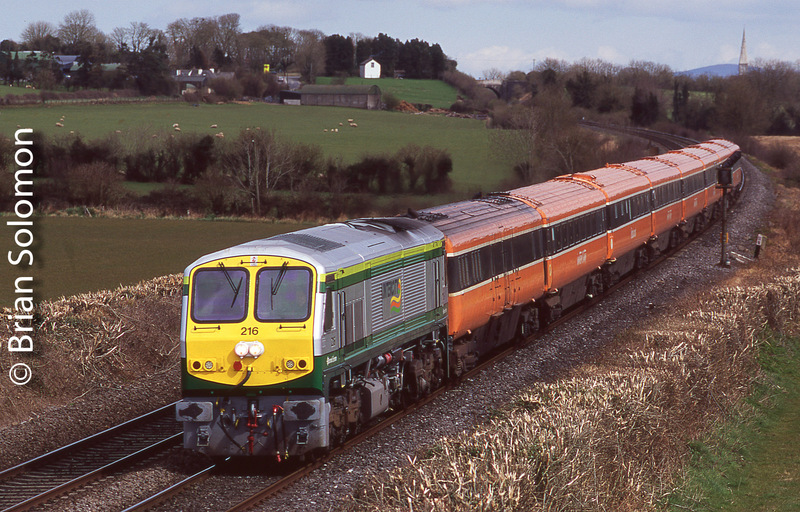 Irish Rail 216 was among the first 201 class diesels I put on film. 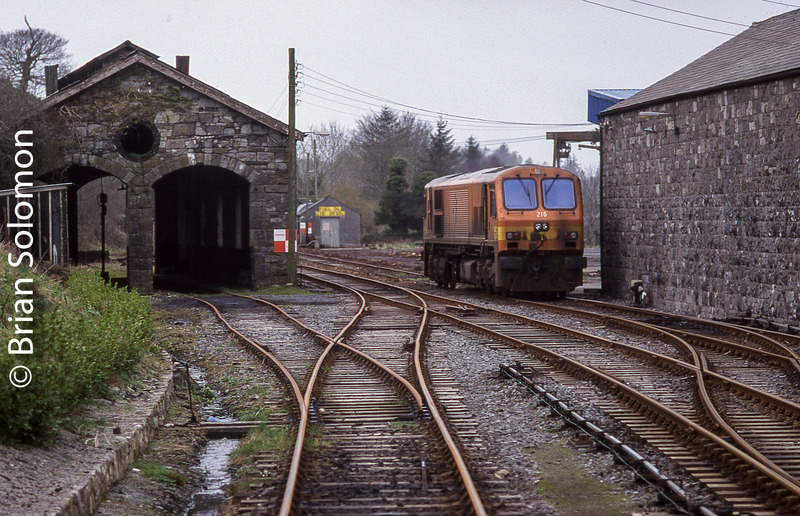 Here it is at Westport, County Mayo back in February 1998. Exposed on Provia100 with my Nikon F3T and 135mm lens. 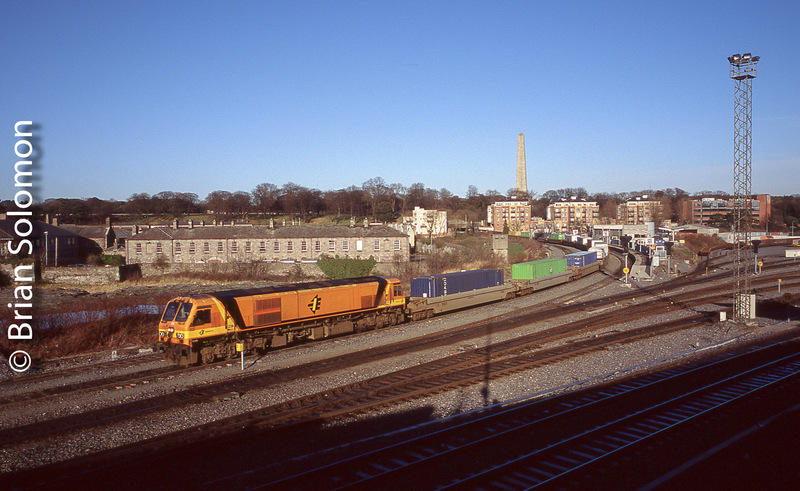 In April 1998, I made this view of 216 at Heuston Station, back when the station shed was blue, but 216 wasn’t! 24mm view with Fujichrome Sensia. 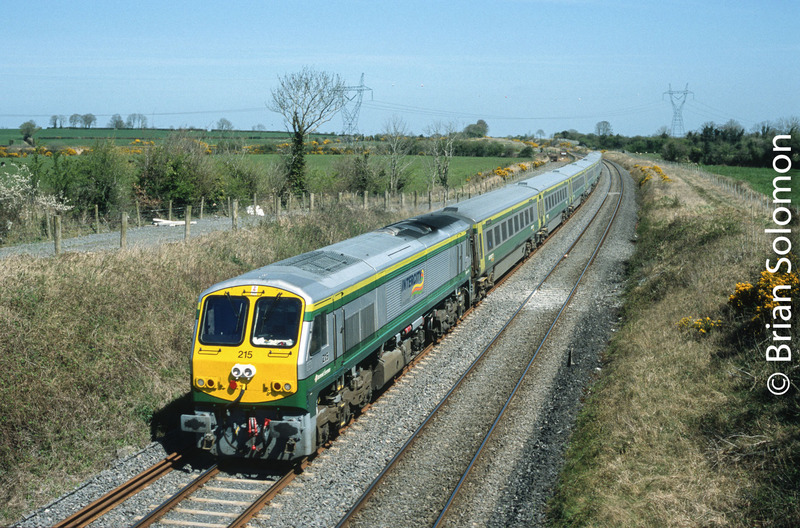 Also in April 1998, 216 with a Mark3 set at Kent Station, Cork. A 135mm view on Fujichrome Sensia (100 ISO). 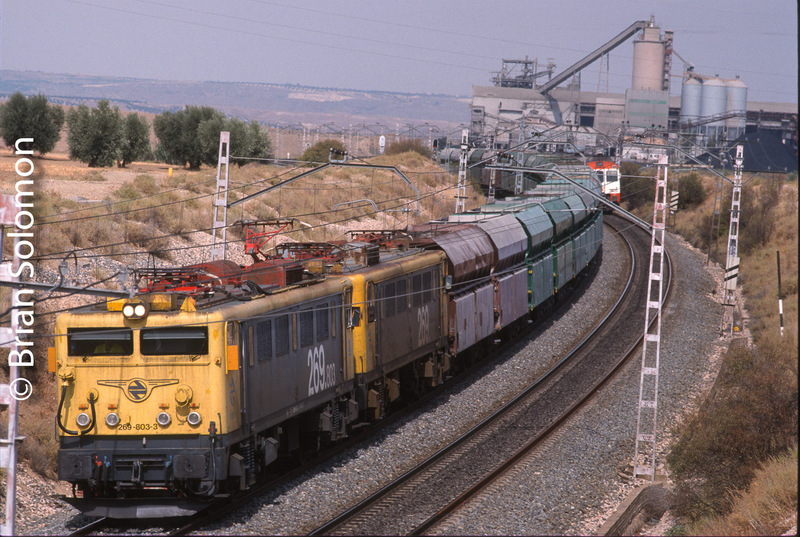 And there’s 216 in fresh green, yellow and silver paint, rolling through Cherryville Junction with a down Mark3 set on 20April2006. How things have changed! 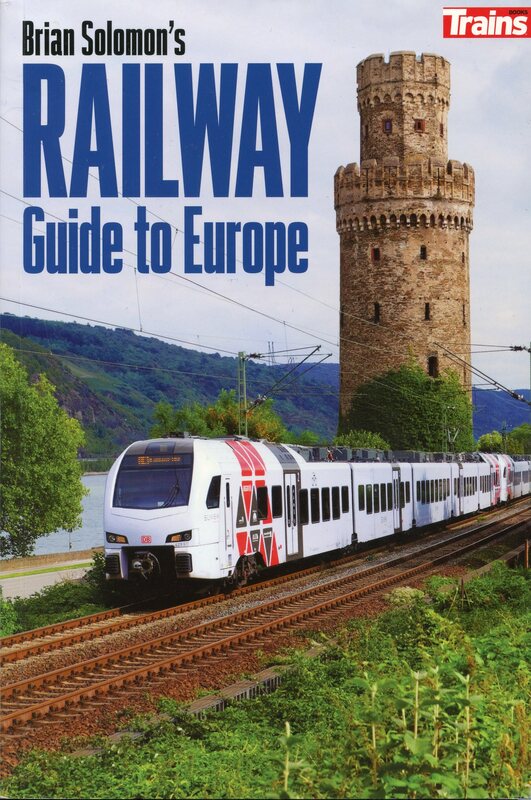 Check out my new book: Brian Solomon’s Railway Guide to Europe, now available from the Kalmbach Hobby Store. Hey! I Thought This Train Seemed Familiar! 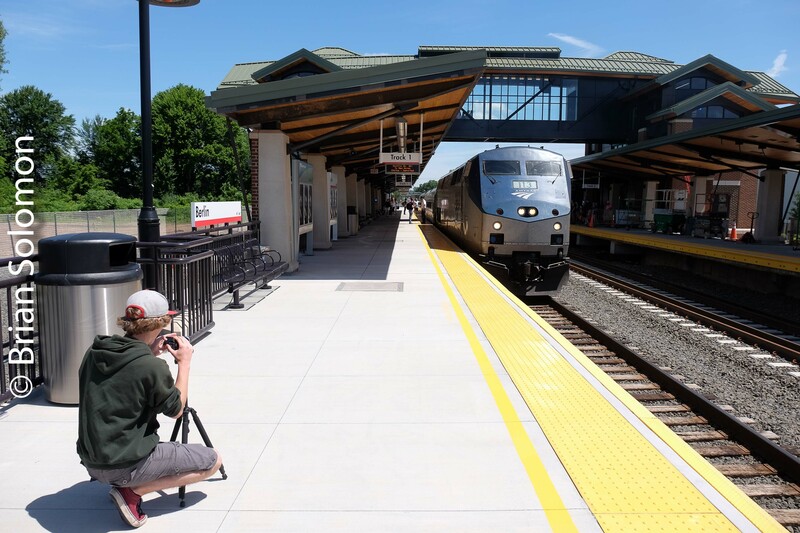 I experienced the new CT rail Hartford Line commuter train for the first time on Saturday. 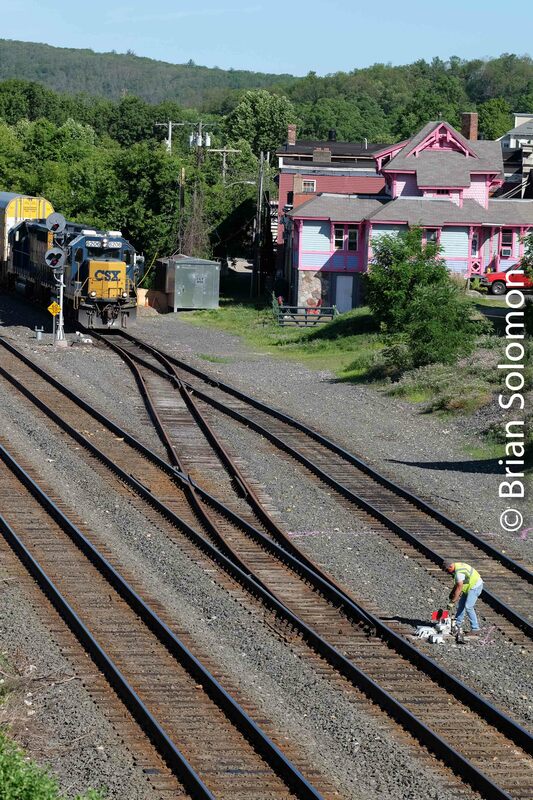 CT rail in Berlin, Connecticut on June 16, 2018. I had this distinct sense of Déjà vu. Then I reviewed the cover of my new book: Brian Solomon’s Railway Guide to Europe. Wow! It’s like a German train at Berlin. Berlin, Connecticut, that is. A German electric multiple unit graces the cover of my book. 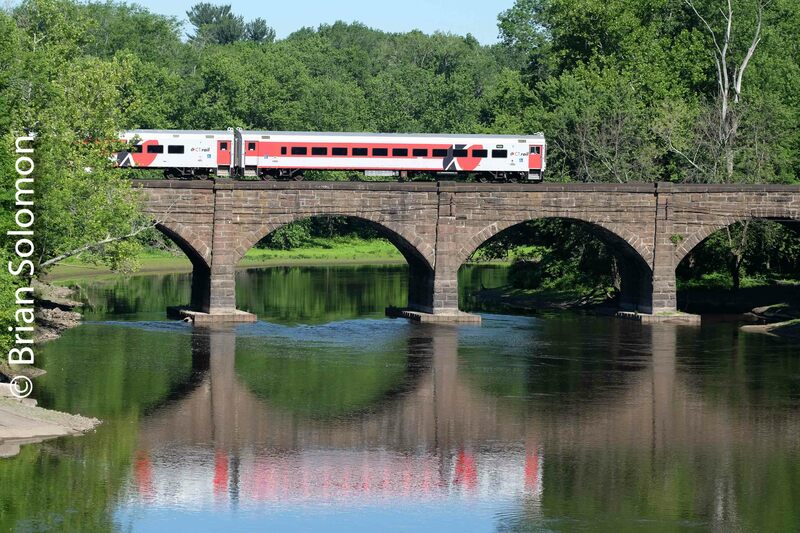 CT rail 6400 crosses an old stone arch bridge at Windsor, Connecticut on Sunday June 17, 2018. 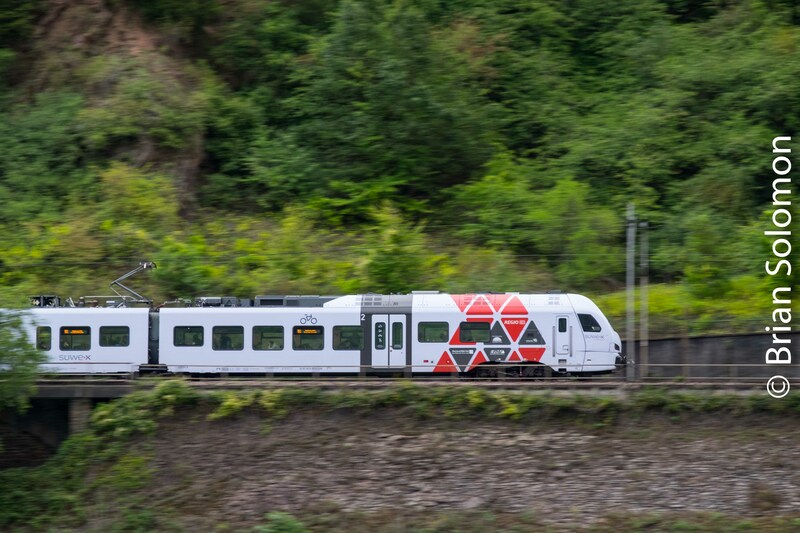 DB and CFL (Luxembourg Railways) EMUs working together on the famous Hanging Viaduct in Germany’s Mosel Valley. 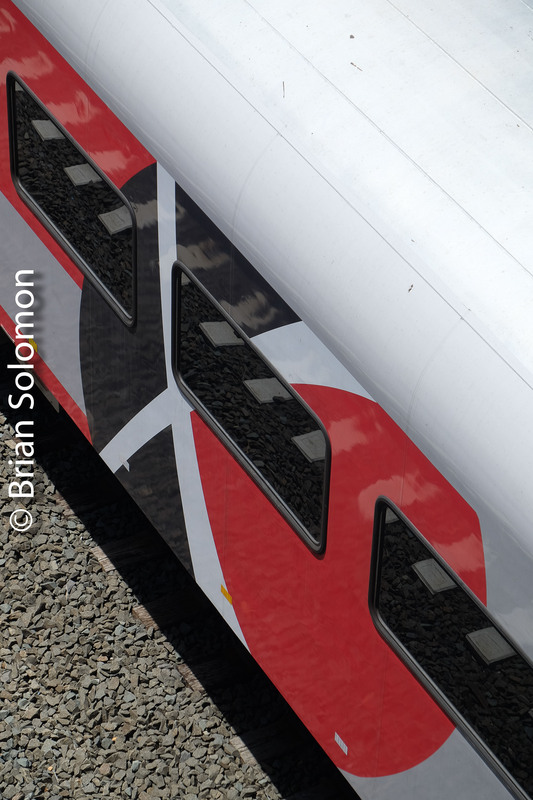 I’m commenting on the paint liveries, not the equipment or the services. If you haven’t seen it, check out my latest book: Brian Solomon’s Railway Guide to Europe, now available from the Kalmbach Hobby Store. 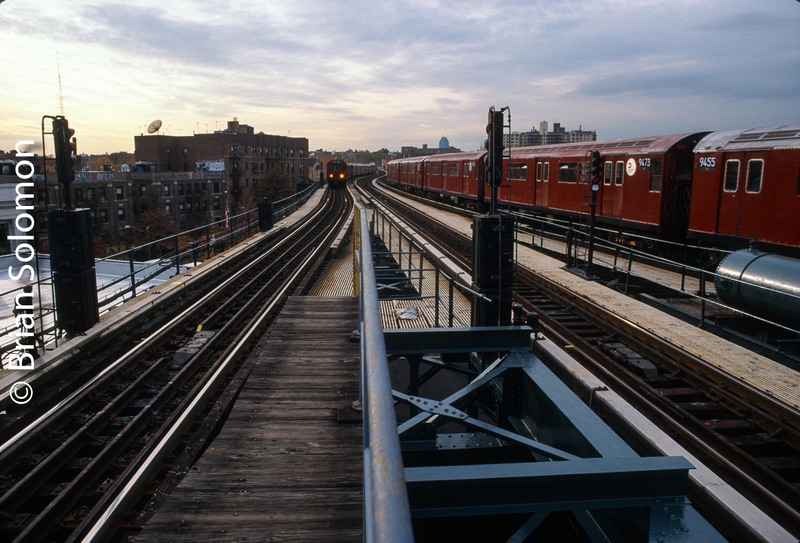 New York City’s Flushing Line November 1998. The other day I found this Fujichrome color slide in my archives. I exposed in on a subway tour with my father back in November 1998. Working with a Nikon F2 with 28mm lens, I made this photo from the end of a platform on the Flushing Line’s elevated structure. I like the subtlety of the autumn sky. For me this brings back memories of long ago. Wide-angle view of New York City’s Flushing Line (that’s the number 7 train). I recall the water color painter Ted Rose telling me about how a yellow sky stirred his memories. That was in regard to a painting he made of a wintery Midwestern scene. His memories, not mine. Similar sky though. My dad claims that my first railway trip was on the Flushing Line in Queens, New York. That was about 1968. All I remember was the dirty floors on the subway cars, and being held up to look out the front window as we rattled along. I made no photos on that day. 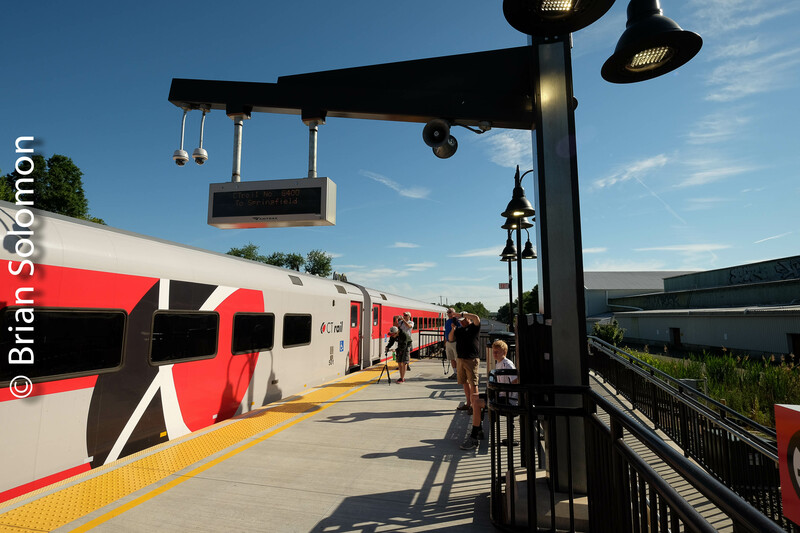 New CT Rail Hartford Line Commuter Trains—First Day in Eight Photos! 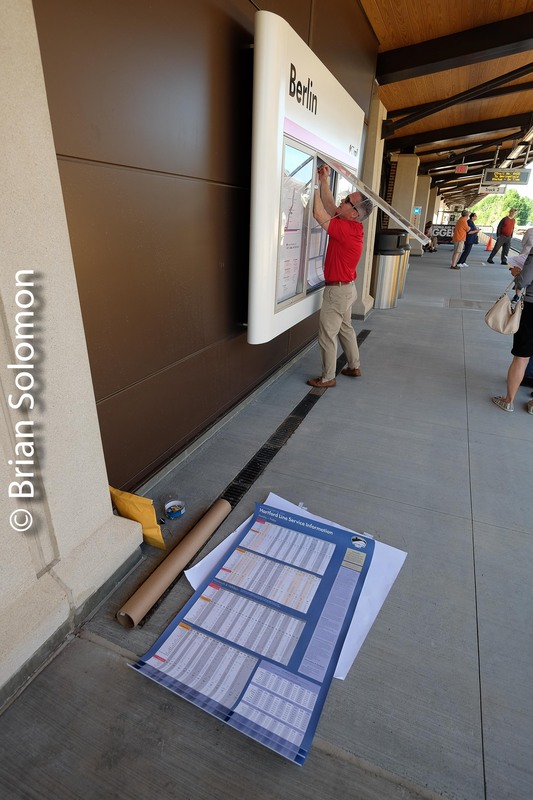 Working with my FujiFilm X-T1, I exposed more than 100 photos of the new Connecticut commuter rail service on the Hartford Line. There’s nothing like the first day. Springfield, Massachusetts on June 16, 2018. Amtrak 461 at Berlin, Connecticut on June 16, 2018. 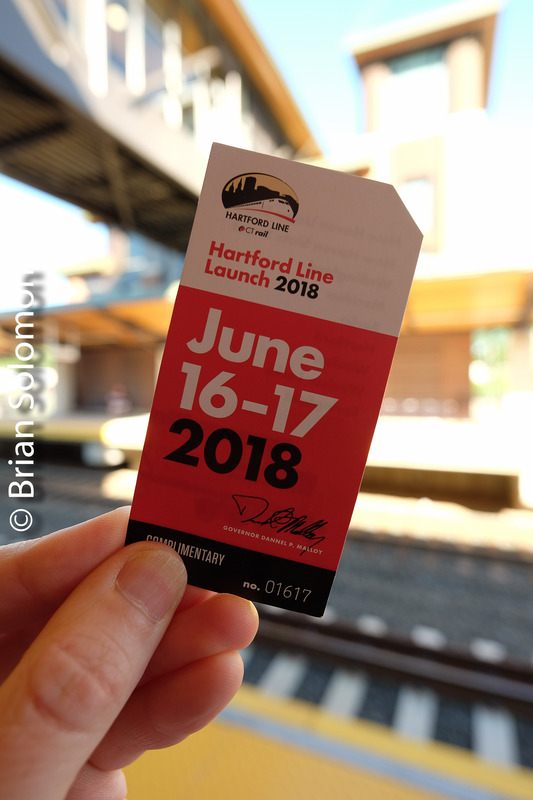 Yesterday, June 16, 2018 the long awaited CT Rail Hartford Line Commuter service commenced. 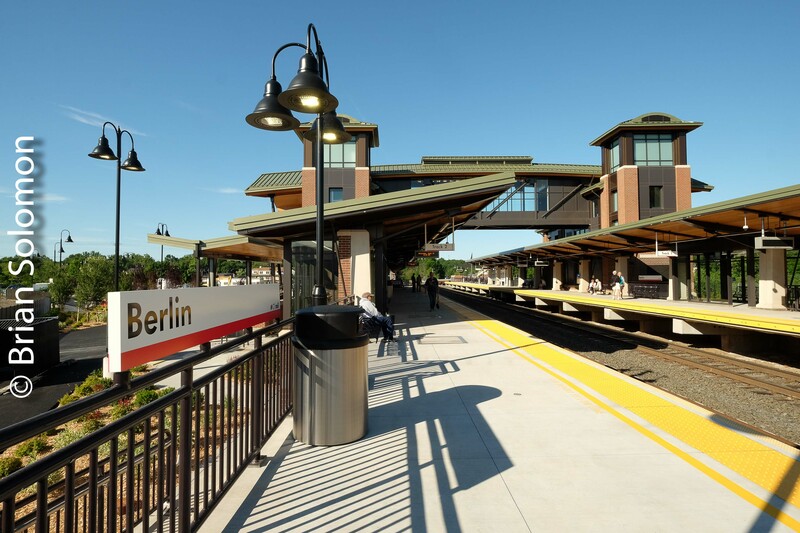 My father and I traveled on the first train from Berlin, Connecticut to Springfield, Massachusetts. It was a bright clear morning. Contrast was a challenge, and for some of these photos I imported the camera RAW image into Light Room for exposure, color balance and exposure adjustment. 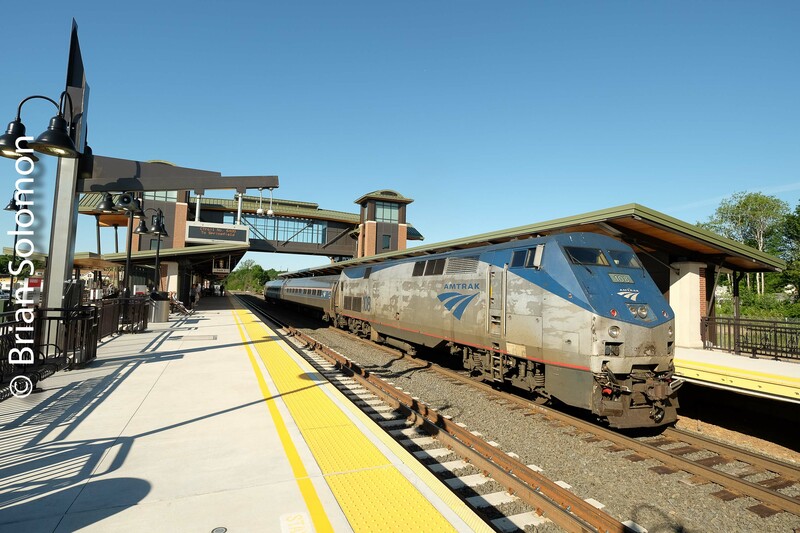 Amtrak 460 at Berlin, Connecticut on June 16, 2018. 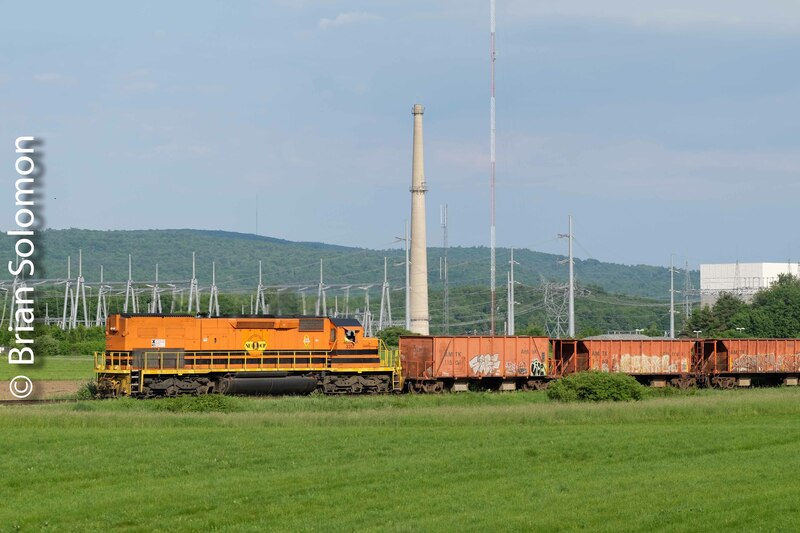 CT Rail 6653 at Berlin, Connecticut on June 16, 2018. CT Rail 6654 at Berlin, Connecticut on June 16, 2018. Tracking the Light EXTRA: CTRail Free Train Ride Today! 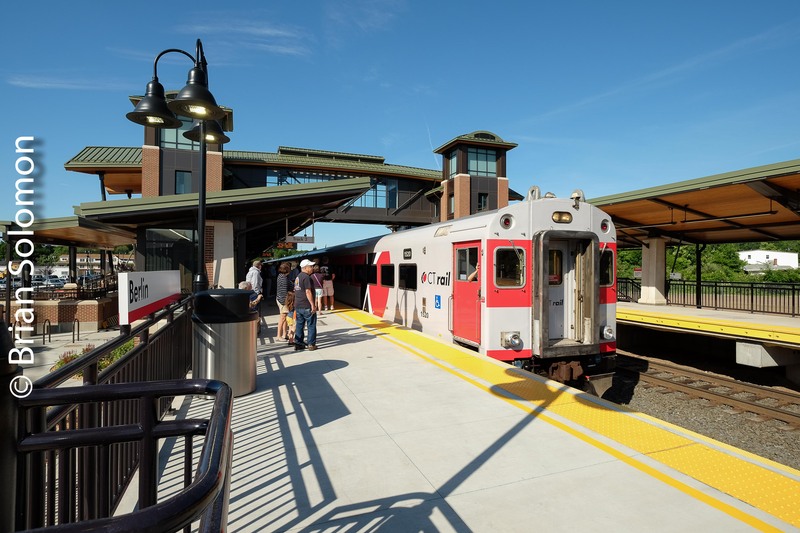 Today, June 16, 2018, the long awaited CTRail service began public operation on the Springfield-Hartford-New Haven Line. 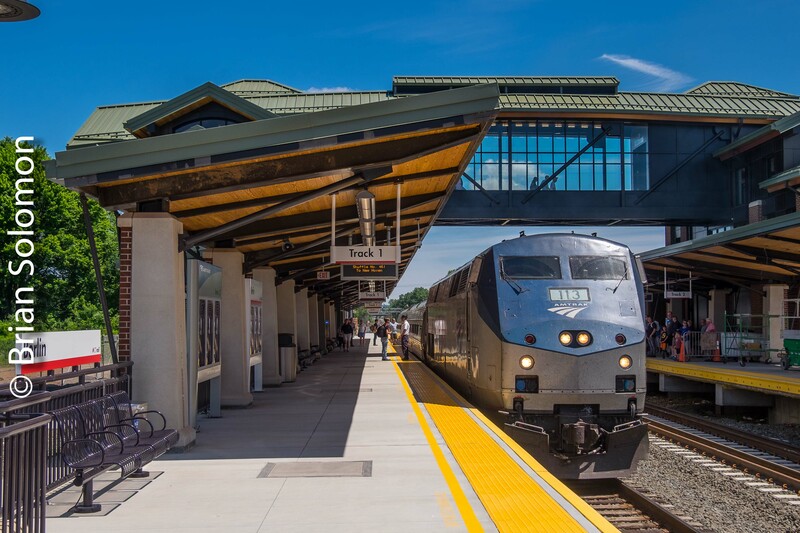 Free rides were on offer on both the new CTRail trains and some Amtrak services. CTRail staff at Berlin supplied complimentary tickets! 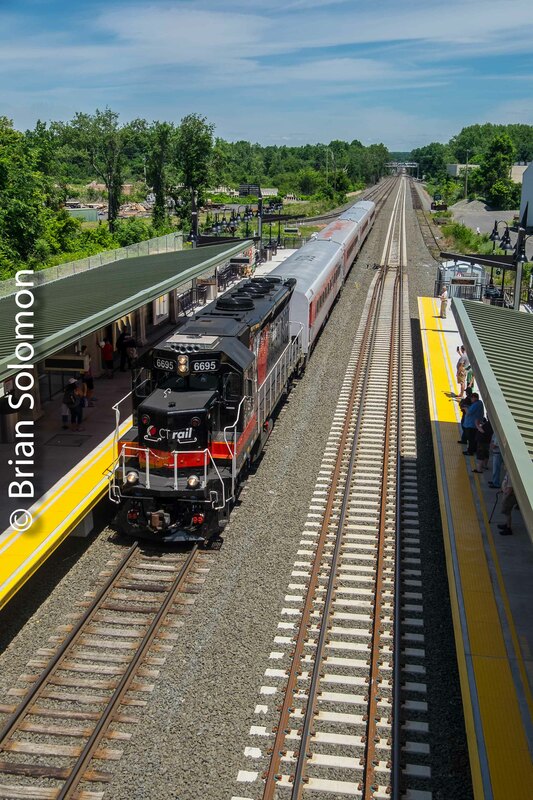 My father and I traveled on the first northward train (CTRail 6400) between the new station at Berlin, Connecticut and Springfield. The train was very well attended! 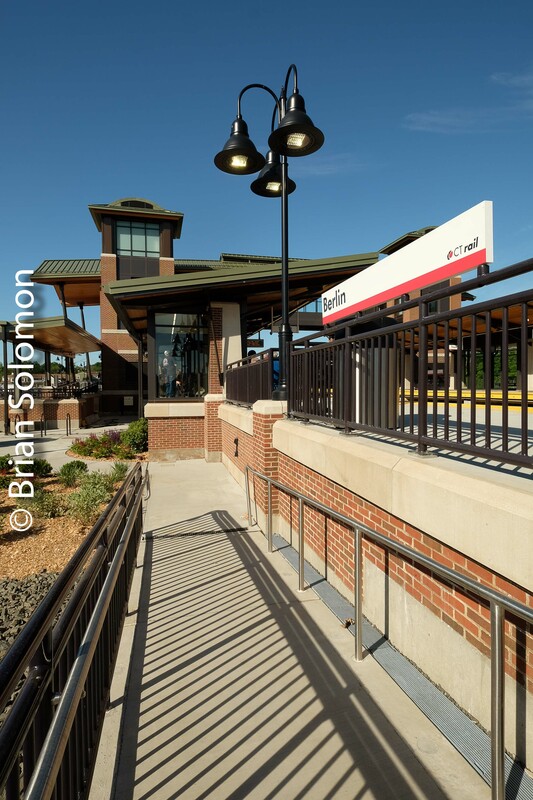 More free train rides are available on the route tomorrow (Sunday June 17, 2018). 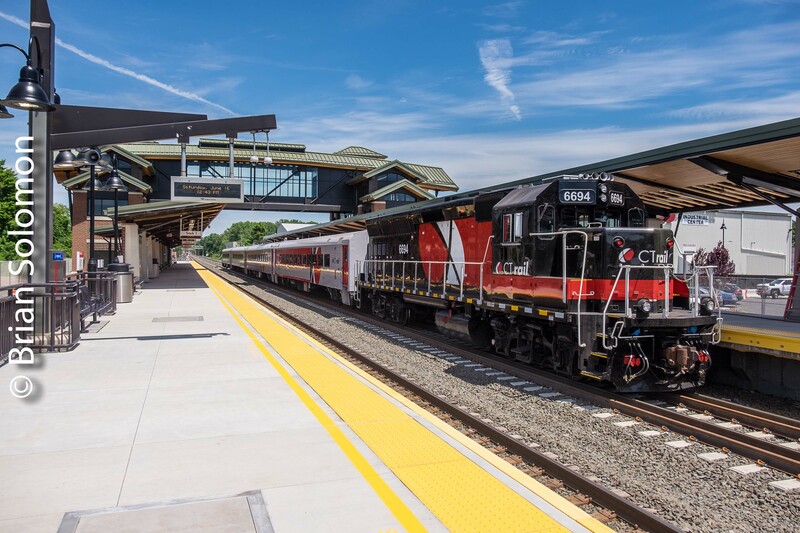 CTRail’s first public forward run, train 6400, makes its stop at Berlin, Connecticut. Exposed using a FujiFilm XT1 with 12mm Zeiss Touit. The view near Windsor Locks, Connecticut. I made many photographs over the course of the day and I’ve yet to look at all of them. Stay tuned for more tomorrow! 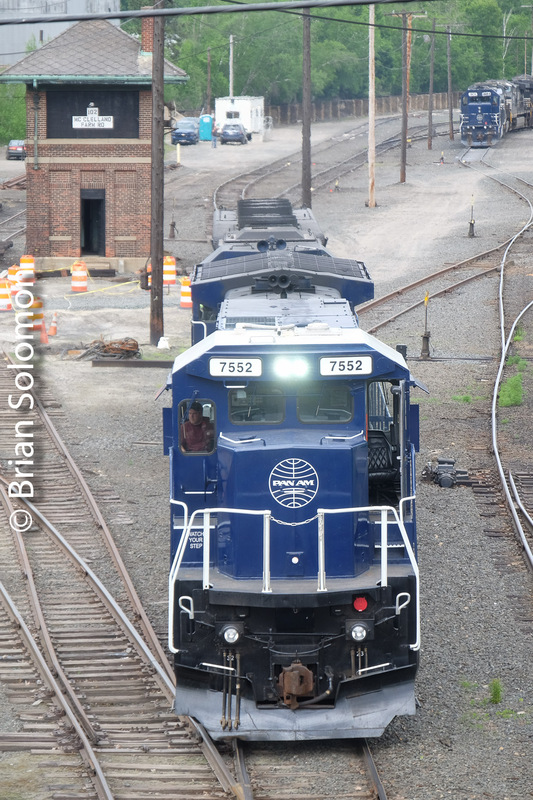 More New England Central GP38s-Four Photos! 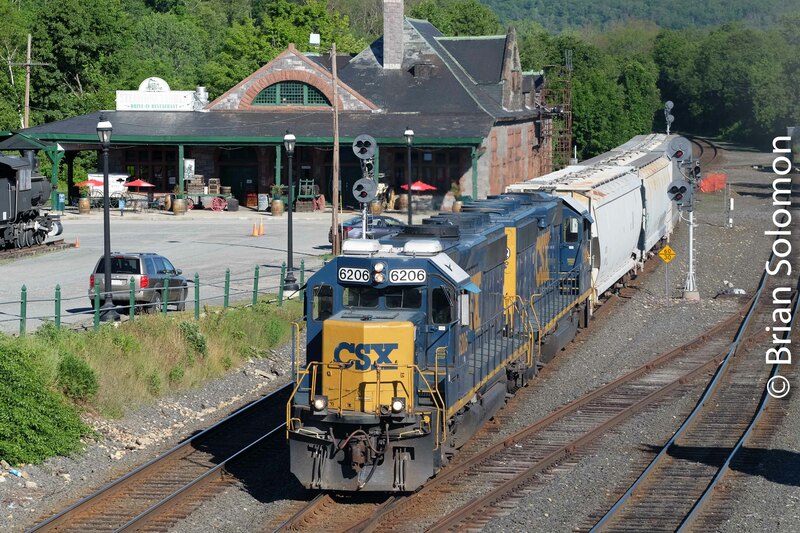 For the last month, New England Central’s 608 (Willimantic, Connecticut to Palmer, Massachusetts and back) has continued to run with a pair of GP38s. 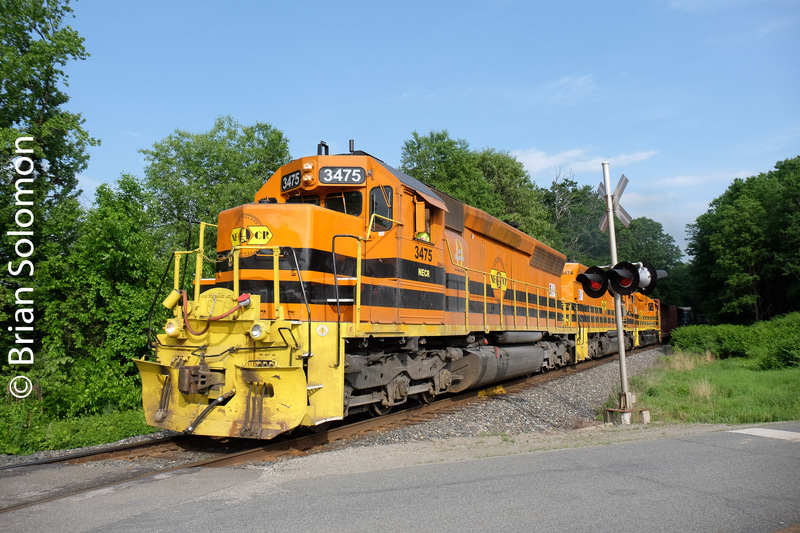 These locomotives began with New England Central when it commenced operations in February 1995, and have continued to work the railroad in the same paint (if not the same numbers) ever since. 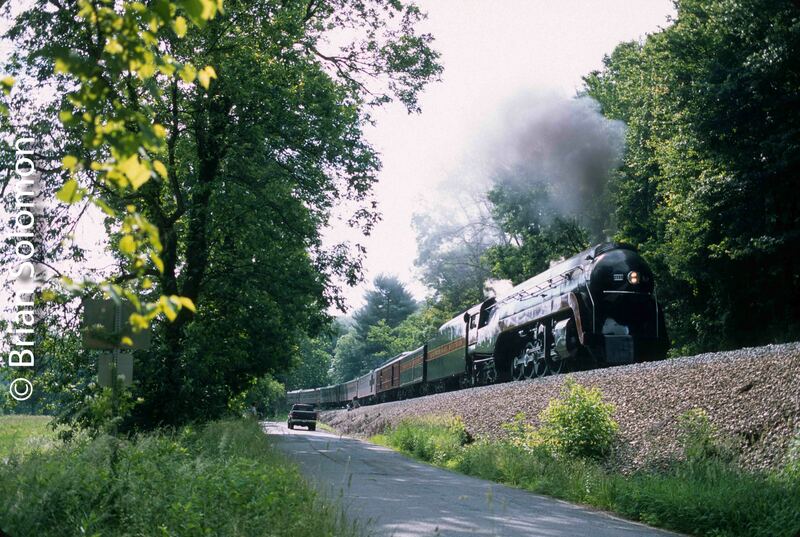 A classic view of 608 running northward near Stafford Springs, Connecticut. Exposed with my FujiFilm X-T1 and 27mm pancake lens. Originally there were a dozen, but the ranks have thinned. New England Central has changed owners twice since 1995; it was originally a RailTex property, then RailAmerica, today Genesee & Wyoming. NECR has acquired or borrowed many other diesels over the years. 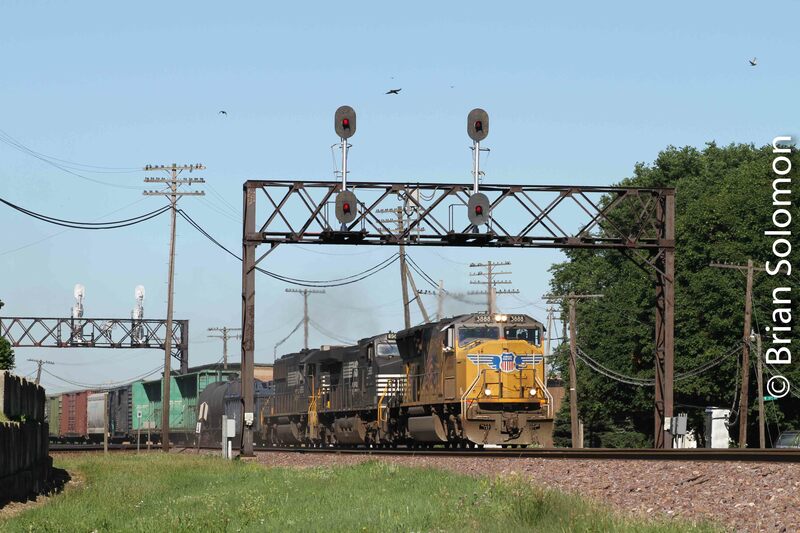 Yet for me the few surviving blue and yellow GP38s offer a sense of continuity, and also represent a throw-back to when EMD’s 645 diesels were dominant on American railroads. How much longer will New England Central continue this vintage railroading? 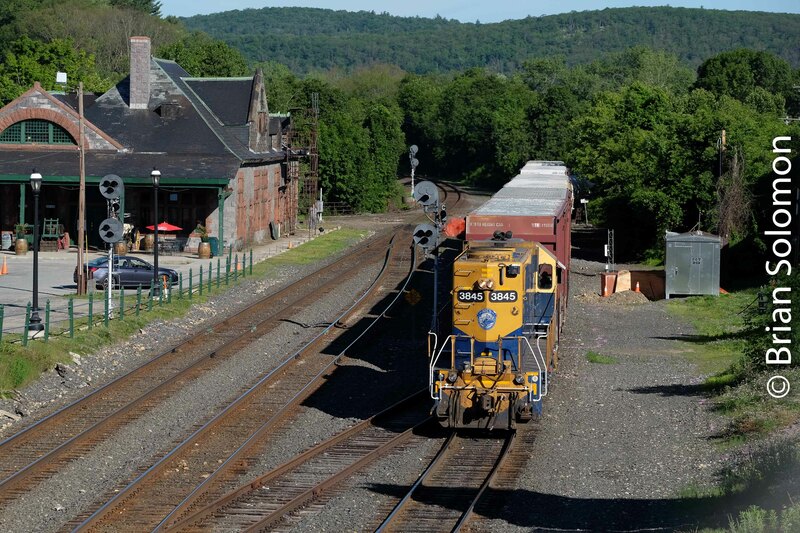 A view of 608 running northward passing Stafford Springs, Connecticut. Exposed with my FujiFilm X-T1 and 90mm telephoto lens. Will these GP38s see G&W corporate colors? Will they be reassigned elsewhere on the expansive G&W railroad family? 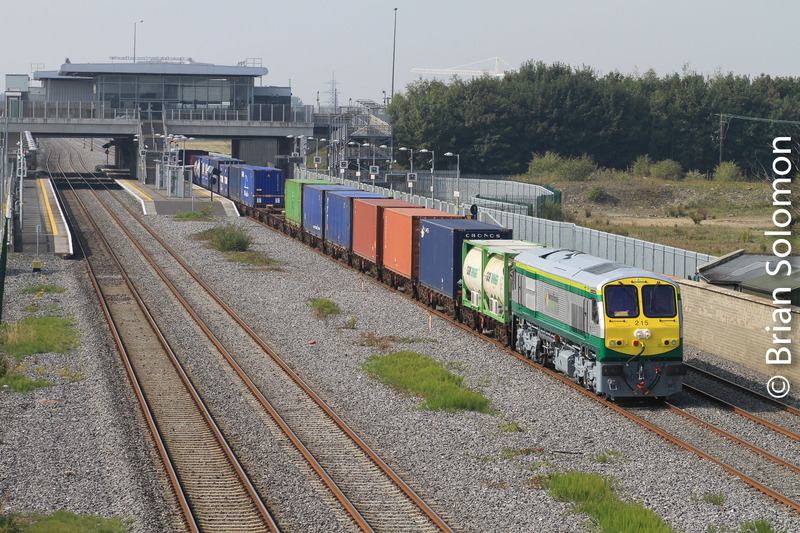 Will newer locomotives assume their duties? Never take anything on the railroad for granted; eventually everything changes. Change makes old photos more interesting. A 12mm view with my Zeiss Tuoit lens fitted to the FujiFilm X-T1. 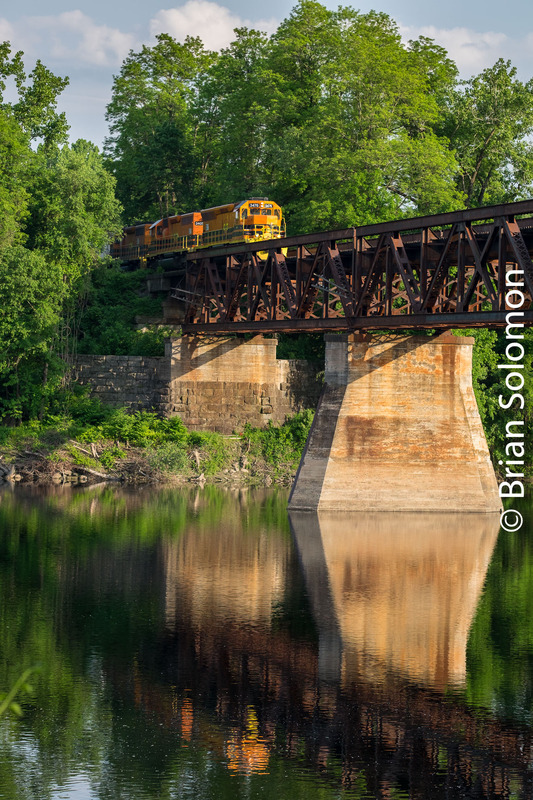 Last week I made these views of New England Central’s northward 611 freight as it crossed the Connecticut River bridge at East Northfield, Massachusetts. 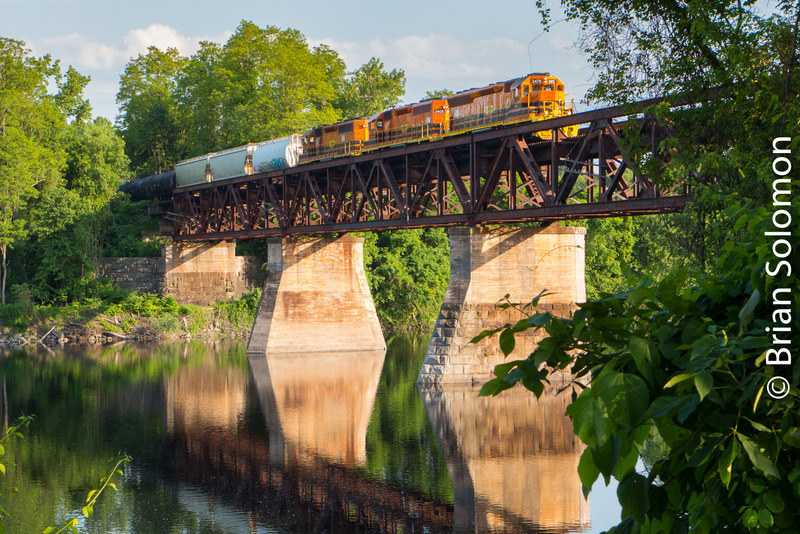 The longer days feature the evening sun in a northerly position that allows for sunlight on the nose of the locomotive as it crosses the bridge. Although I’ve often worked the south side of this span, this was the first time I’ve made successful photos of a train from the north side. Exposed with a FujiFilm X-T1 and prime (not zoom) 90mm telephoto lens. Several turbo-flutters later (about 8 digital ‘frames’ or exposures), also made with my FujiFilm X-T1 and prime (not zoom) 90mm telephoto lens. I was watching the light and the effect of reflections in the river as I composed my photos. For these digital images I was working with both my Lumix LX7 and FujiFilm XT1. Lumix LX7 photo. The locomotives are more fully on the bridge, but here I’ve lost the effect of the nose reflection in the water. Oh No, Not the Dreaded 215! Again . . .
Irish Rail 215. Is this my least favorite of the 201 class locomotives? It’s probably my most photographed. My first recognition of the 215-effect was on a trip to Galway many years ago. Friends were visiting from America and we were traveling on the Mark3 International set. Soon after departing Dublin Heuston, it was evident that the train was in trouble. We weren’t making track speed. 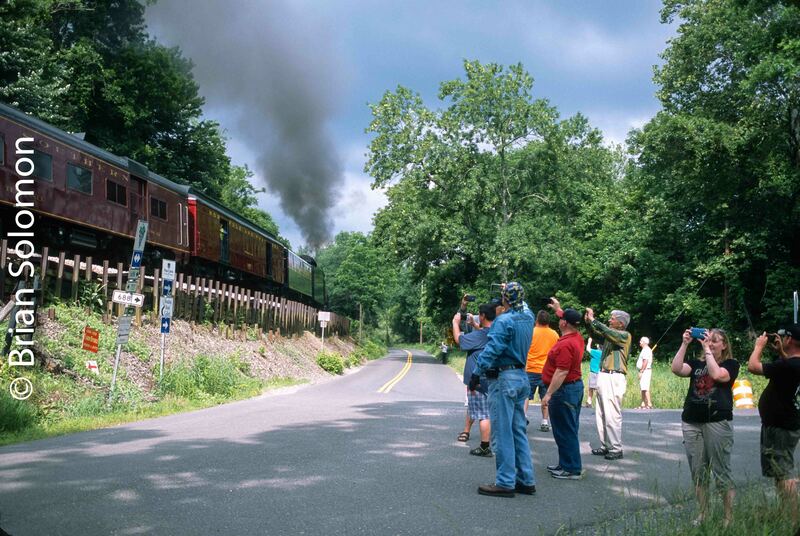 When we got to Hazelhatch, our train took the loop. Old 215 had failed. We waited there for about 40 minutes until 203 was summoned for a rescue. Some months later, I returned from Boston to Dublin, and on the front page of the papers was 215 at Heuston Station—on its side! It had derailed. 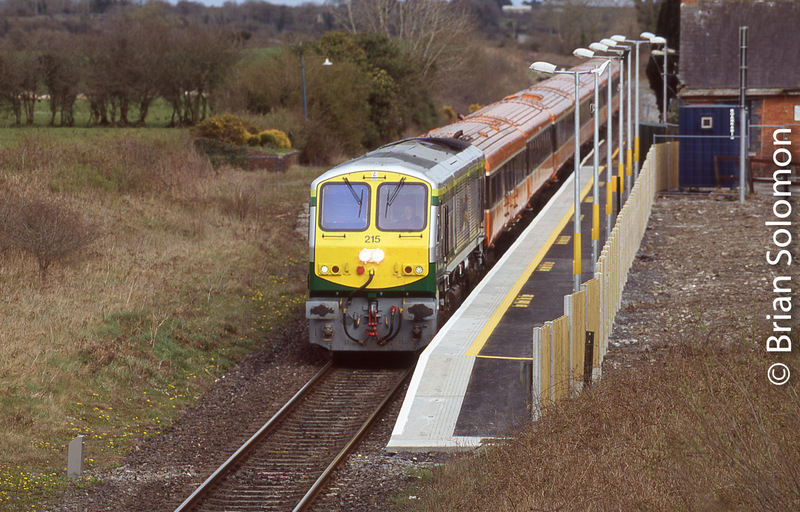 15April2006 Irish Rail 215 works the Galway train passing Attymon. Fujichrome slide. 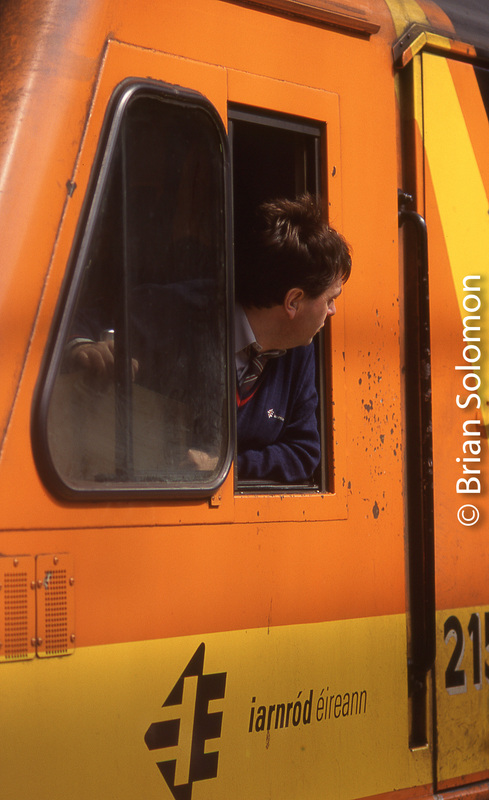 Possibly one of my first photos of 215, working the Mark3 push-pull at Westland Row in Dublin, April 1998. Fujichrome exposed with a Nikon F3T and 135mm lens. 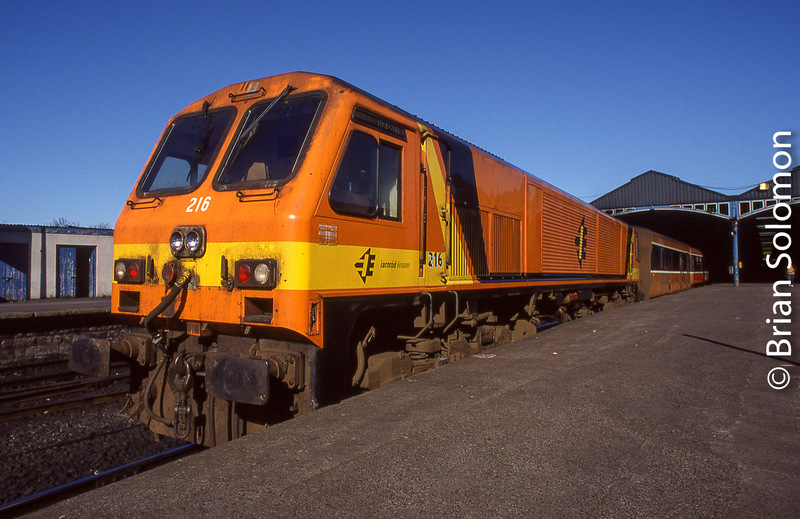 Old 215 in orange paint at Pearse Station in 1998. 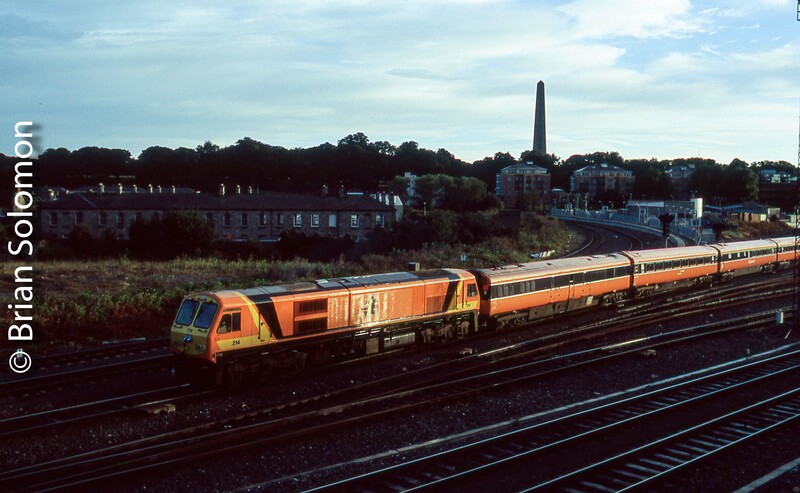 And which loco worked the very first publically scheduled Mark IV set from Dublin to Cork? 215 with a patch! 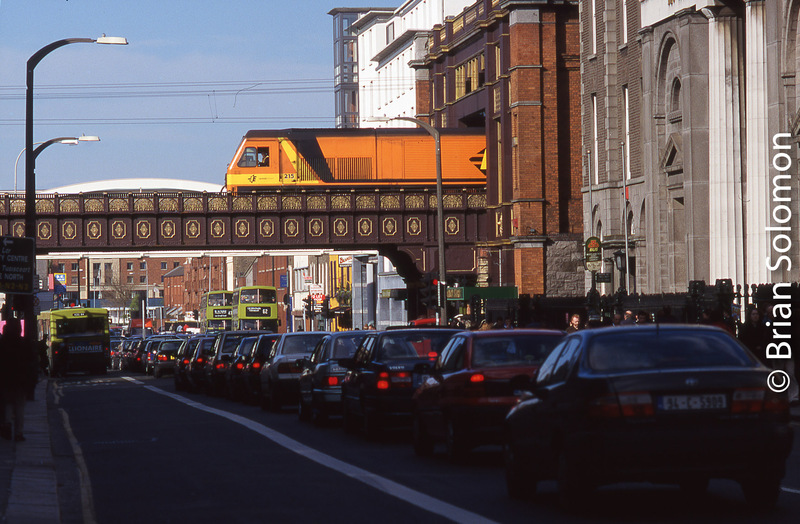 Islandbridge Junction in September 2006. Not its first trip on the Mark4 set, nor its last! Out for the down train, take a guess which loco I’m most likely to catch! Here’s a Mark4 trial in April 2006. Revenue working began a couple of weeks later. Top of Ballybrophy bank on the Dublin-Cork mainline. Uh! There it is again. Damn thing is a like a shadow. Near Newbridge on 14 April 2009. Back when film was all I had. Irish Rail 215 in clean paint with the up-road IWT liner passing Fonthill. Märklin’s Mickey Mouse at Köln! It was a lucky shot. I was changing trains at the Köln Hauptbahnhof in 1999, when I made this photo from the platforms at the east side of the station. 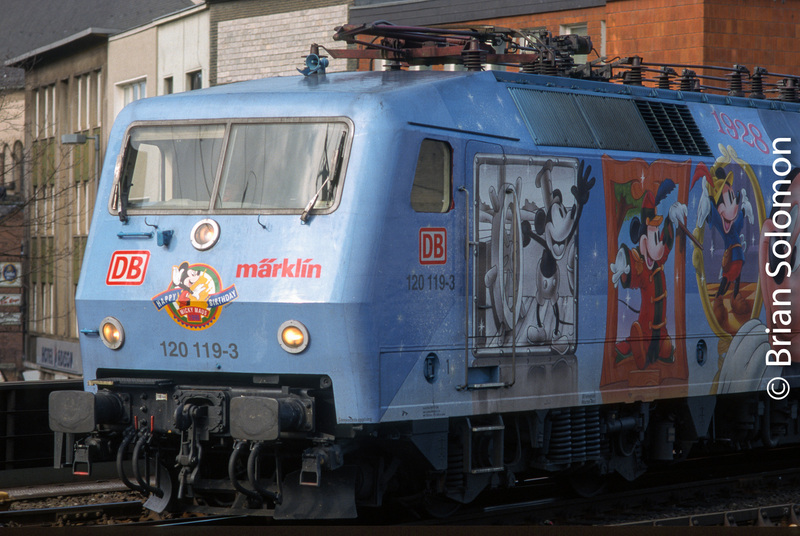 A DB Class 120 electric had been specially painted by or for Märklin model trains to commemorate the 70thanniversary of Disney’s Mickey Mouse. I wasn’t expecting this locomotive, but as it went by I made a few choice photographs on Fujichrome Sensia using my Nikon N90S and a 105mm lens. One of the great things about exploring German railways is a tremendous variety of trains complete with unexpected surprises in the form of specially painted locomotives, antiques on the roll, and special trains. Germany is one of my favorite countries to visit and among the places profiled in my new book: Brian Solomon’s Railway Guide to Europe, now available from the Kalmbach Hobby Store. Pacing the New England Central. (see: Extra train on New England Central. https://wp.me/p2BVuC-5yy). I rolled down the passenger-side window of my friend’s Golf, and exposed a series of photos with my Lumix. Lumix LX7 RAW file adjusted for color, contrast, and exposure in post processing. I’ve described this technique previously; I adjusted the f-stop (aperture control) manually to its smallest opening (f8), my ISO was at its slowest setting (80), and I put the camera to aperture priority. I intended this combination of settings to automatically select the appropriate shutter speed for ideal exposure, while using the slowest setting to allow for the effect of motion blur. 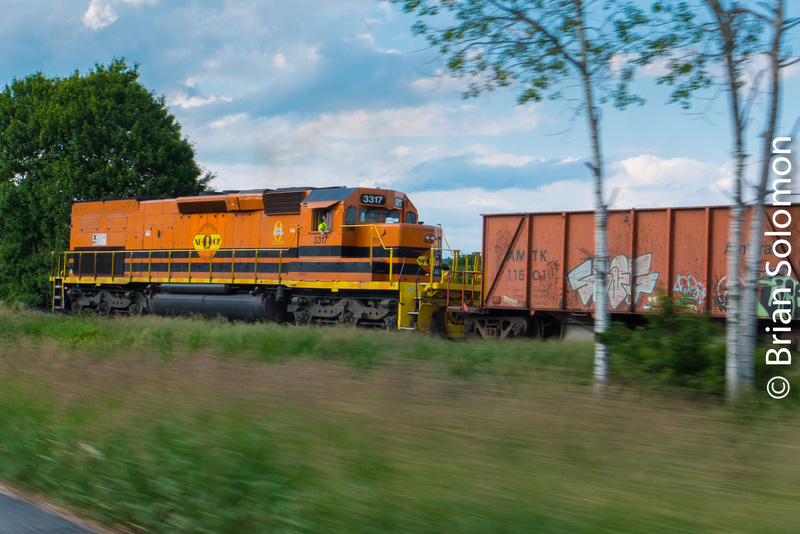 I kept the camera aimed at the locomotive while allowing for ample foreground to blur by for the effect of speed. This works especially well to show the large diesel working long-hood forward, which is not its usual position. 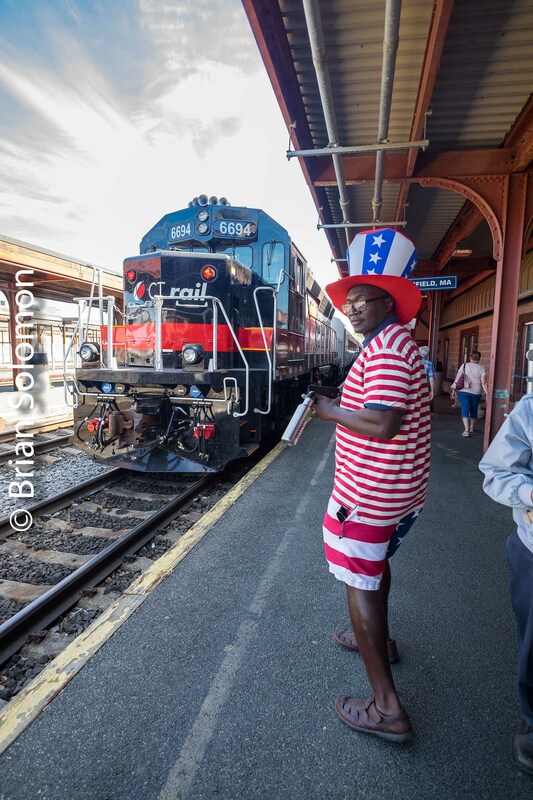 Amtrak’s Vermonter with American Flags. This is a grab shot; I didn’t have time to do what I intended (and the sun went in). 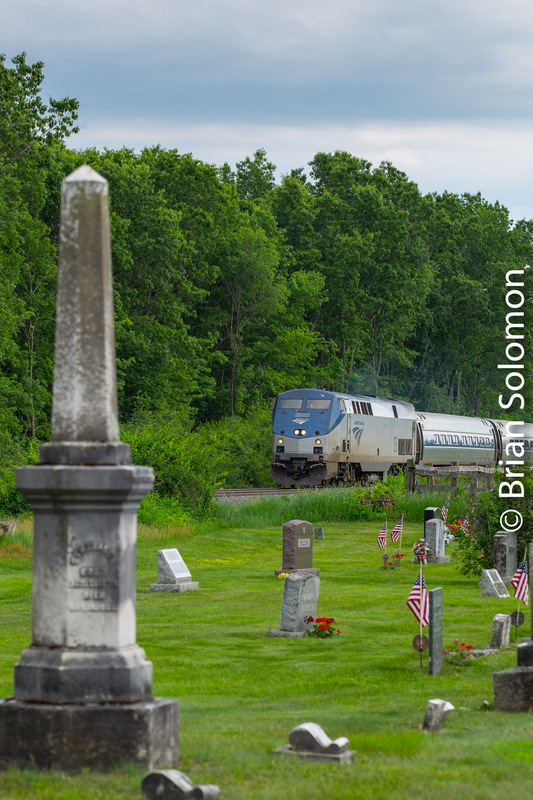 We arrived at the small cemetery at West Northfield, Massachusetts minutes before Amtrak 56 (northward Vermonter). 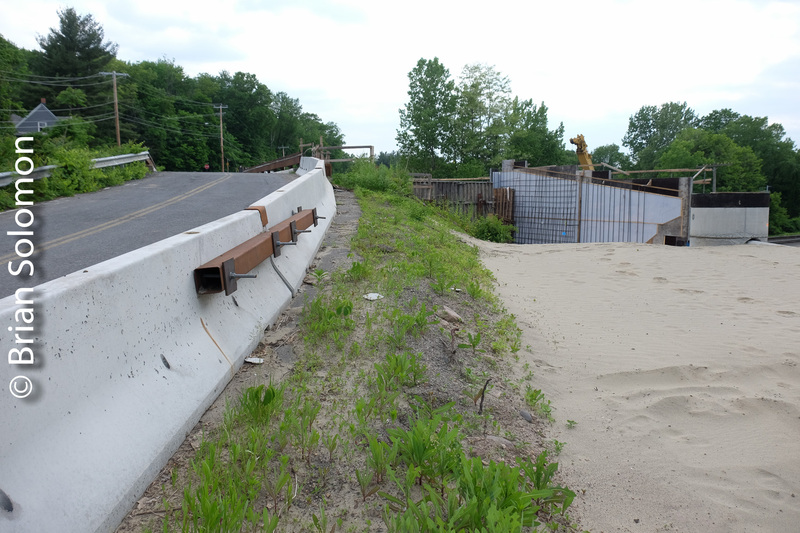 The brush along the railroad has recently been cut. Unfortunately, a brush cutting/removal machine was awkwardly (as in non-photographically) positioned by the tracks, foiling my intend angle for a photo. I was going to try ‘plan b’. I’d heard the crew call ‘Approach’ for East Northfield, I was hoping for time to swap to a wide angle lens, when I saw the headlight. No time: so instead, I hastily composed this vertical view using my FujiFilm XT1 with 90mm lens. The front of the locomotive is nearly centered. I wonder if I should have let it move a bit more to the left for a more effective composition? I like the American flags, placed for Memorial Day. I wonder about my placement of the front of the locomotive relative to the gap in the brush. Should I have let the locomotive continue a few more feet to the left? Extra! Extra train on New England Central. We’d heard there was an extra move. We didn’t know what it was. I got a bit confused as to where the extra was in relation to the regular northward New England Central 611 (that runs weekdays from Brattleboro to Palmer and back). 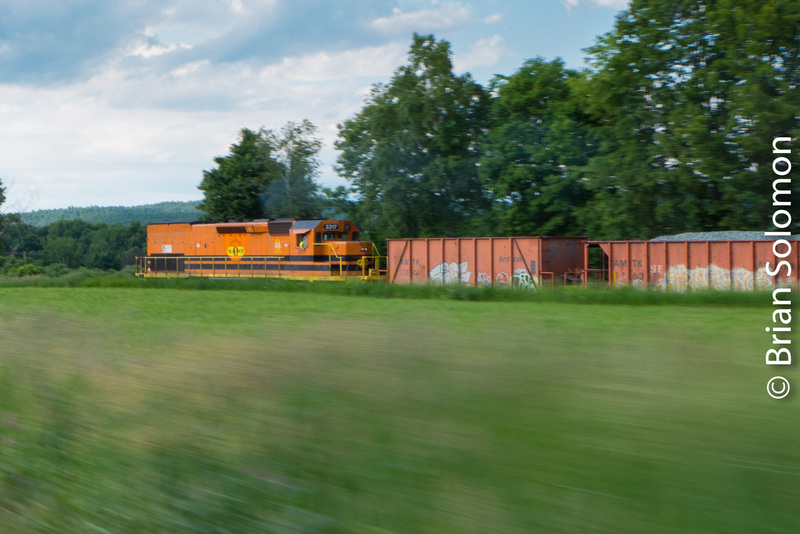 After being out of position, and some quick driving to recover, we managed to get the extra on the move at Vernon, Vermont. This consisted of the lone New England Central former Southern Pacific ‘tunnel motor’ (SD40T-2 number 3317) hauling some ballast cars. This isn’t Donner Pass! 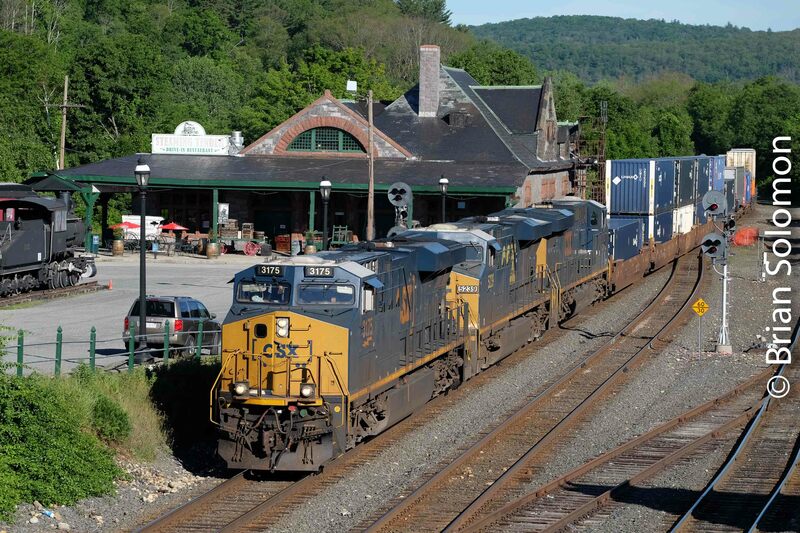 Here’s a former SP tunnel motor working long-hood forward leading a ballast extra at Vernon, Vermont. In the background is the decommissioned Vermont Yankee Nuclear generating station. 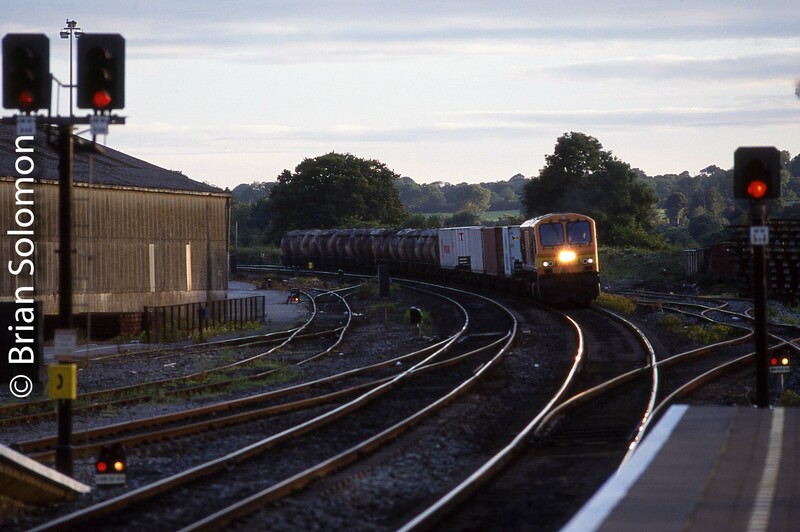 The regular freight followed about an hour later. Both photos were exposed using my FujiFilm X-T1 with 90mm Fujinon telephoto lens. 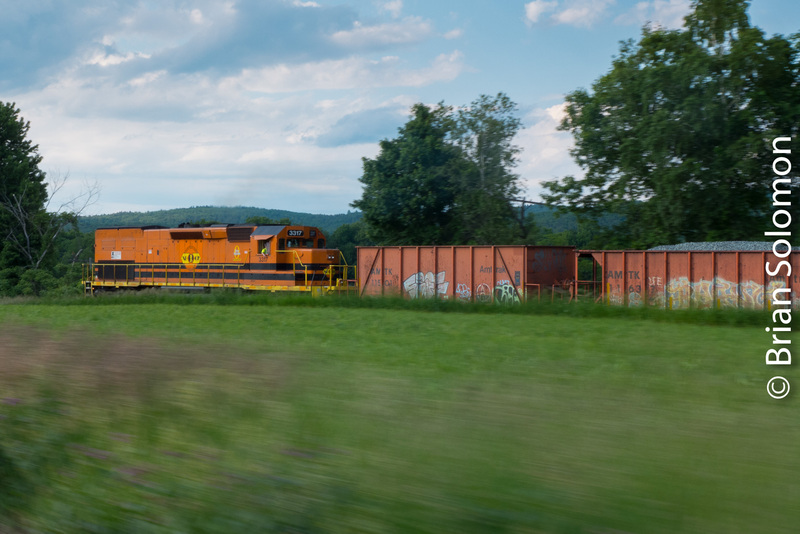 NECR 611 on its northward run from Palmer, Massachusetts at Vernon, Vermont. Brian’s Limited Edition Prints, Signed & Numbered. Just three prints remain for sale! Order one today! 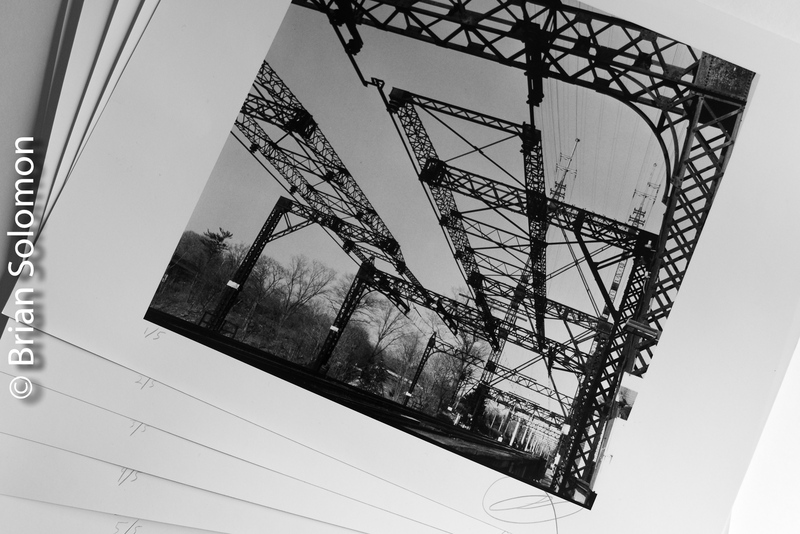 I’ve made five traditional 11×14 black & white prints of my recent photograph of the former New Haven Railroad electrification and drawbridge at Westport, Connecticut. This represents the first time I’ve printed one of my ‘stand processed’ black & white negatives. The prints are signed in pencil and numbered 1/5 to 5/5. I exposed the photograph using a vintage Rolleiflex Model T with Zeiss 75mm lens on 120 black & white film. I processed using the ‘stand processing’ technique to obtain maximum tonal range with deep shadows and delicate highlights. I made these silver prints in the traditional way on Ilford double weight 11×14 photographic paper, fixed and washed to archival standards. These have been pressed and are suitable for matting and framing. I chose the Westport drawbridge because it is graphically engaging and historically significant. This bridge and electrification are examples of early 20thcentury infrastructure in daily use on one of America’s busiest passenger lines. Grand Central Terminal—From A Different Angle. Working with a Leica and Visoflex reflex-viewing attachment mounted on a tripod, I exposed this Kodak Kodachrome 64 slide with a 200mm Leitz Telyt telephoto lens. Looking toward the skylights of New York Central’s architectural masterpiece. I calculated the exposure using an old GE handheld light meter, which I promptly dropped on the floor of the famous New York City terminal, destroying the device’s sensitive electro-mechanical photocell and needle. That was back in 1986. It turned out that my meter had been giving me hot readings. After I bought a new meter a couple of days later, I began obtaining more accurate daylight readings and better overall Kodachrome exposures. 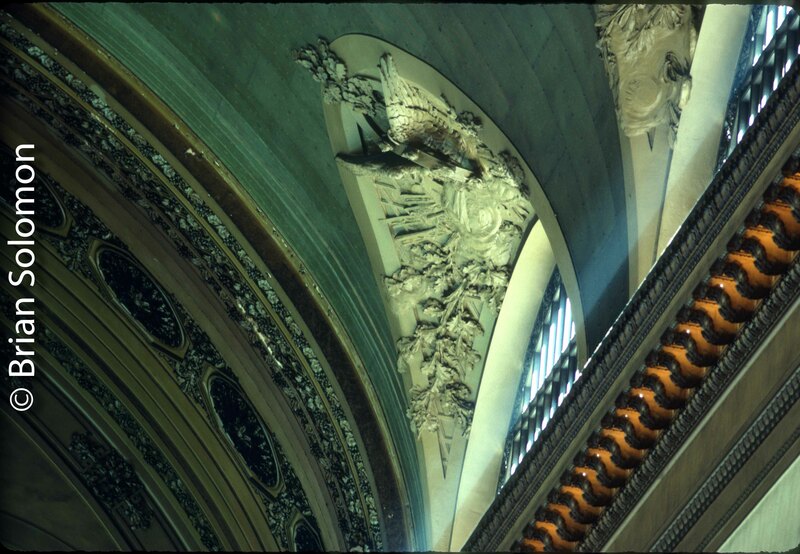 However, because the meter had been encouraging me to ‘over-expose’ (allow more light to reach the film than I intended), I actually produced a better color slide here at Grand Central Terminal, because slight over-exposure was necessary to balance the lighting and bring out the grandeur of the architecture. If I’d exposed as I intended, my photo would have appeared darker. So, what makes this photo effective was the result of accidental relative over-exposure. How about that? Irish Rail 214: Two Sunrise Views, Dublin and Mallow. 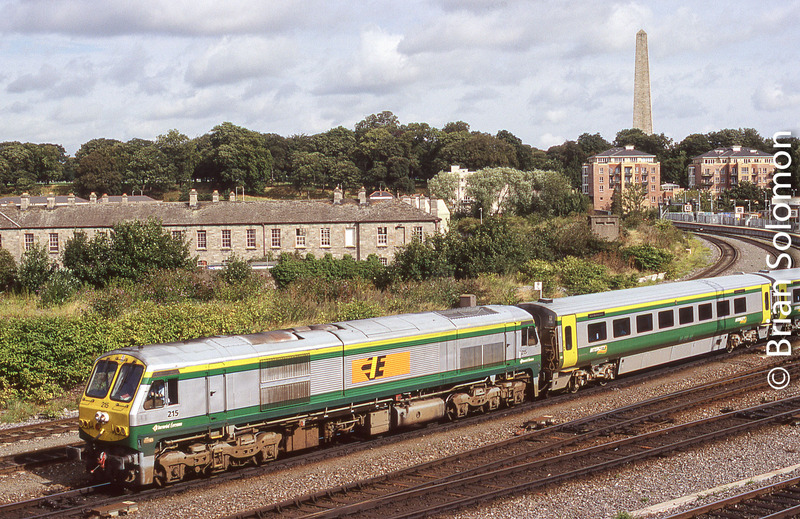 This pair of photos depict Irish Rail class 201, engine number 214 at work on passenger and freight. The top photo was exposed in July 2005. 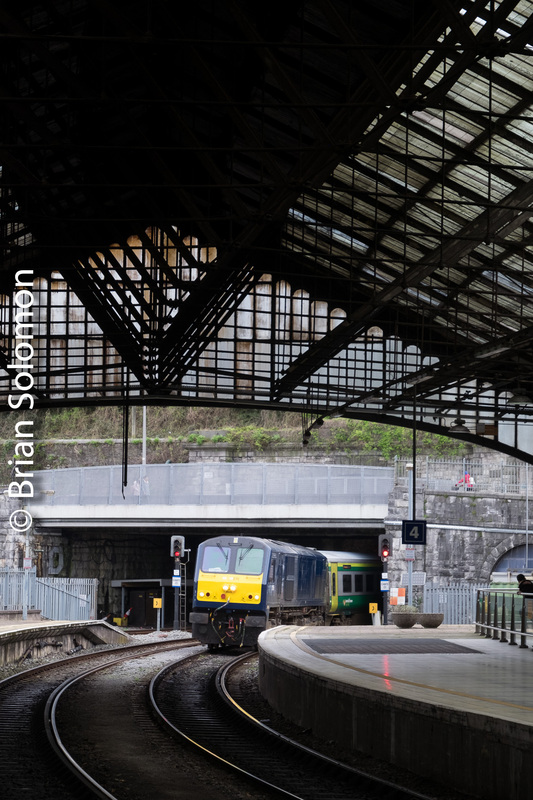 I wanted to make a photo of the 0700 (7am) Dublin-Cork passenger train departing Dublin Heuston, before the service was changed to one of the new Mark4 sets. My theory was that this service was rarely photographed leaving Dublin owing to the early hour and backlit sun. I had months left to do this, but by July the days were getting shorter, and by the following summer the Mark 4s would be in traffic. (It pays to think ahead). So I went to my favorite spot on the St. John’s Road, and used my Contax G2 with 28mm lens and exposed a few frames of Fujichrome Sensia (100). Irish Rail 214 departs Dublin with the 0700 train for Cork. Today the Mark3 carriages are a memory and 214 is stored at Inchicore. The bottom photo was exposed at Mallow on 18 July, 2003 at 0622 (6:22am). I’d gone out for another train, but instead caught this late running cement that was carrying some containers at the front. The train paused for three minutes at Mallow to change crews. Here, I worked with Fujchrome Sensia (100 ISO) using my Nikon F3 with a 180mm Nikkor telephoto lens. 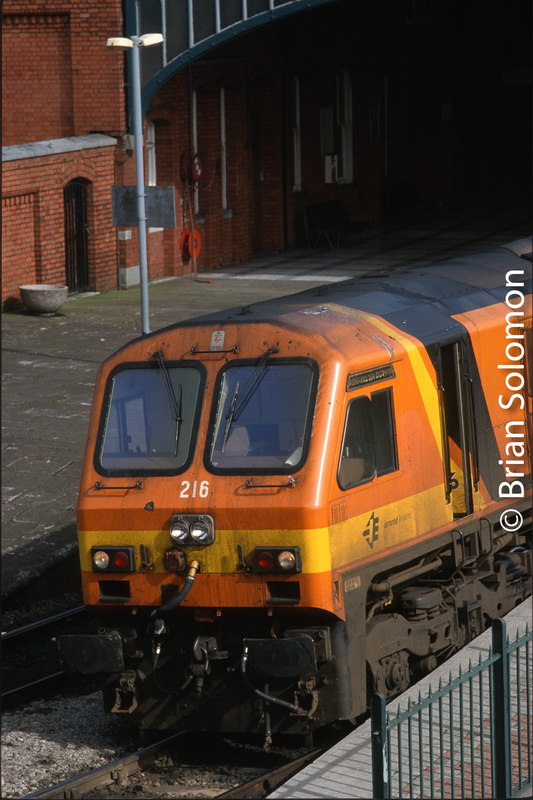 These are part of my continuing series on the Irish Rail 201 class locomotives aimed to mark my 20 years of railway photography in Ireland (1998-2018). Headlights too Bright? Now What? I’d heard complaints about this. You’ll find my solutions are the very end of this blog text. Pan Am Railway’s 7552, a former CSX General Electric-built DASH8-40C (sometimes simplified as ‘C40-8’), features modern white light-emitting diode (LED) headlights. The sun went in, so I ‘opened up’ the aperture to f5.6. This exacerbated the effect of LED headlight bleed. The problem is that these white LEDs viewed head-on are much brighter than ordinary incandescent-bulb headlights. Unnaturally bright headlights may have some advantages; they undoubtedly offer better illumination and can be spotted from greater distance. However they tend to be mesmerizing, which may have something less than the desired effect from a safety point of view. I first encountered these headlights about 10 years ago photographing an electric locomotive in Munich, Germany. With the sun out slightly, I used a smaller aperture and also was nominally off-axis, two things that help minimize the effects of light bleed. For photography bright LED headlights pose a couple of problems. They can confuse both auto exposure and auto focusing systems, and as a result may contribute to under exposed and/or out of focus digital photos. Also, many digital cameras only have a limited ability to handle extreme contrasts, resulting in an unappealing effect that I’ll call ‘light-bleed’, when bright light appears to spill over to adjacent areas of the image. A similar problem is a ghosting effect caused by reflections from external filters or inner elements on some lenses. I found that these LEDs are only unacceptably bright when viewed head-on, so by moving off axis, you can greatly reduce the unpleasant visual effects of these bright lights. That’s one solution, anyway. Here I’m significantly off axis, which virtually eliminates the bleed problems. Another way to suppress headlight bleed is to select a smaller aperture (larger f-number). I work my cameras manually, so this is easy enough to accomplish. If you are using automatic modes, you’ll need to select an aperture priority setting that allows you to control the aperture. Just mind your shutter speed or you might suffer from motion blur. On this day, June 6, 2015, I photographed Norfolk & Western 611 Under Steam. It was three years ago that Pat Yough and I traveled to Manassas, Virginia, where we were joined by our friends Vic and Becky Stone, and spent several days with Norfolk & Western J-Class locomotive 611 under steam. Although I largely worked with digital cameras, I also exposed some color slides to capture the spirit of the event. These images were made using Fujichrome Provia 100F with my Canon EOS-3, I scanned the slides yesterday (June 5, 2018) using a Nikon Super Coolscan5000 using VueScan software. Powell Wye at Manassas, Virginia, June 6, 2015. Markham, Virginia, June 6, 2015. 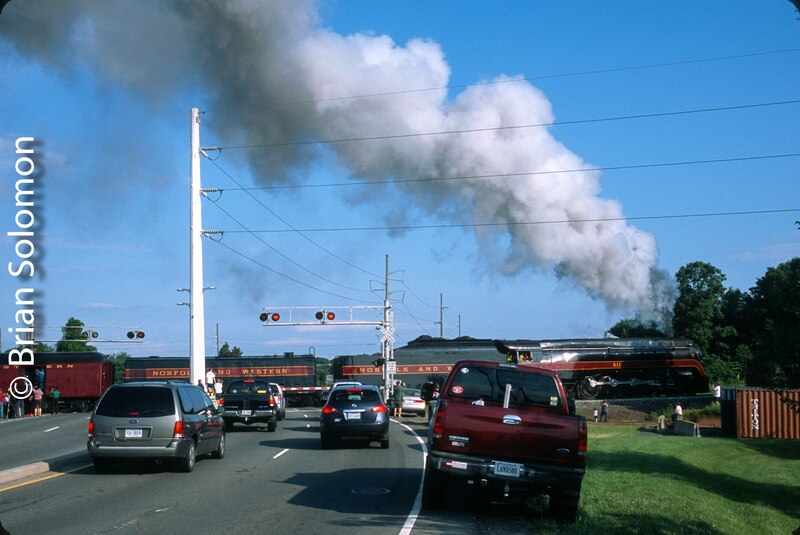 Smart phones and steam, Markham, Virginia. 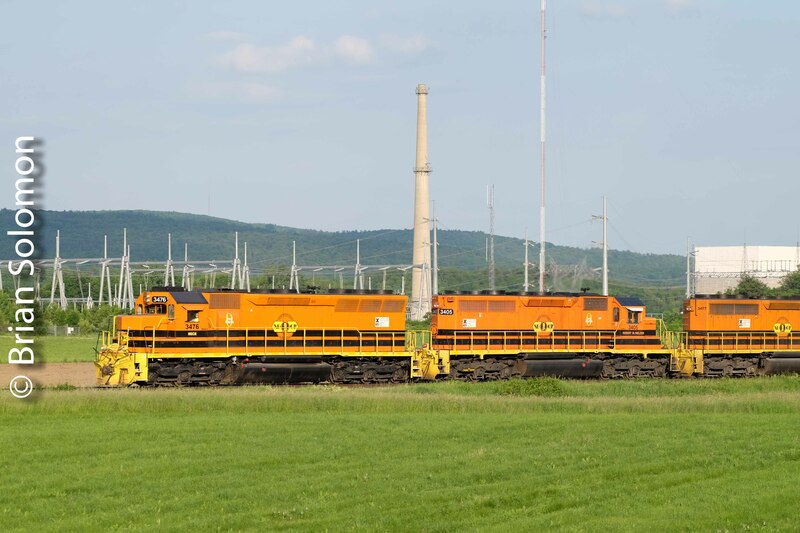 Four New Photos: New England Central Six-Motor EMDs in Orange. After years of operating its fleet of second-hand EMD diesels in a rainbow of ragtag paint liveries, today most of New England Central’s locomotives wear clean Genesee & Wyoming corporate colors. 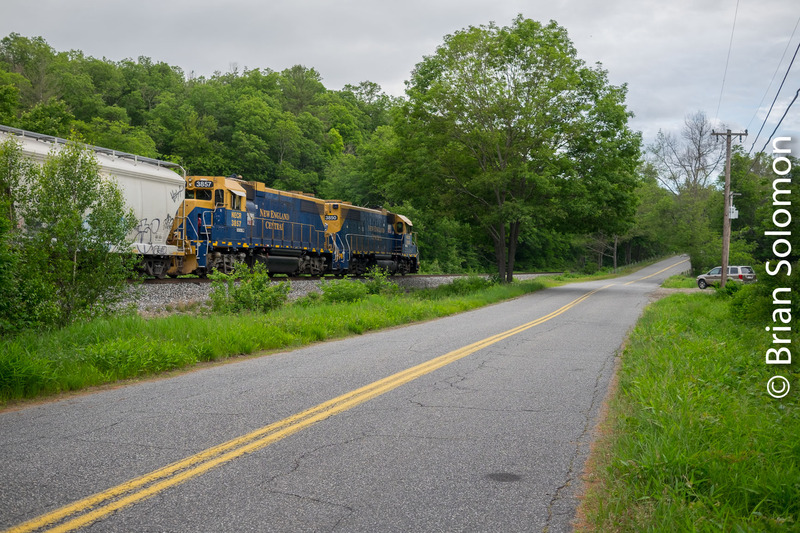 A few of the 1995 painted blue and yellow GP38s survive, lately working the Palmer area and south into Connecticut. 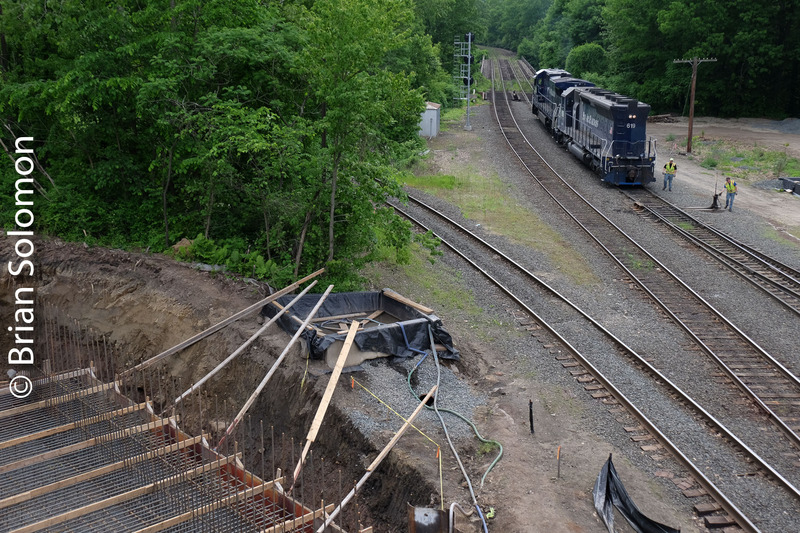 New England Central at East Northfield; Boston & Maine Connecticut River Line at the right (operated by Pan Am). Fear not, I have no shortage of images from New England Central’s patch-work paint era. 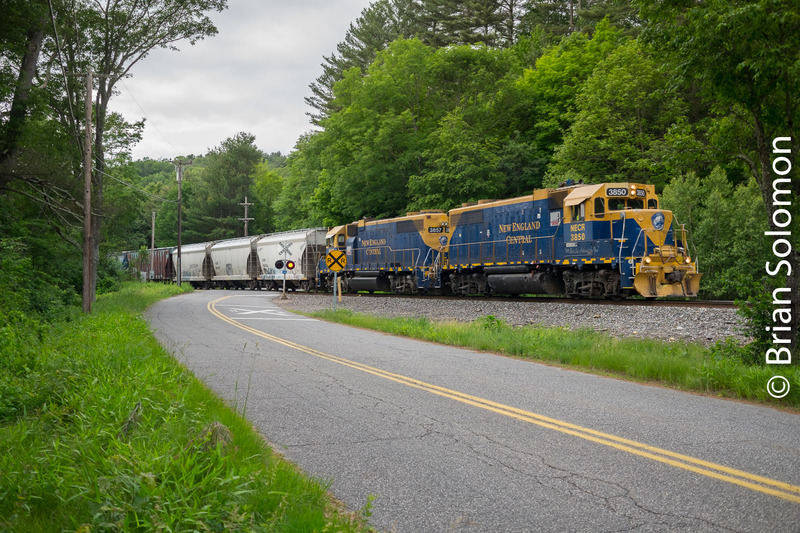 Working with my FujiFilm X-T1 digital camera, I made these photos last week, of freight 611 on its northward run to Brattleboro, Vermont from Palmer, Massachusetts. Soft afternoon sun and a matched set of 1960s-era six-motor EMD diesels in clean orange paint makes for a nice subject. 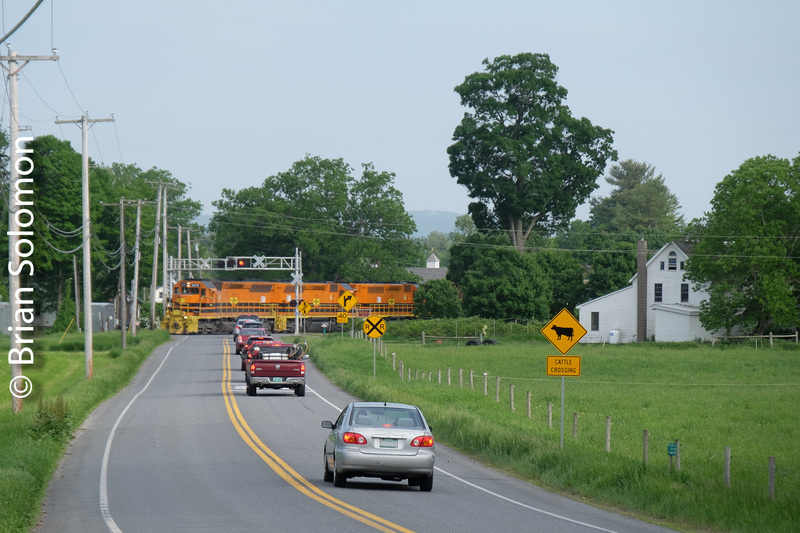 A ‘grade crossing wedgie’ (tight view of locomotive crossing a road) in South Vernon, Vermont. A crossing view in Vernon featuring the road. 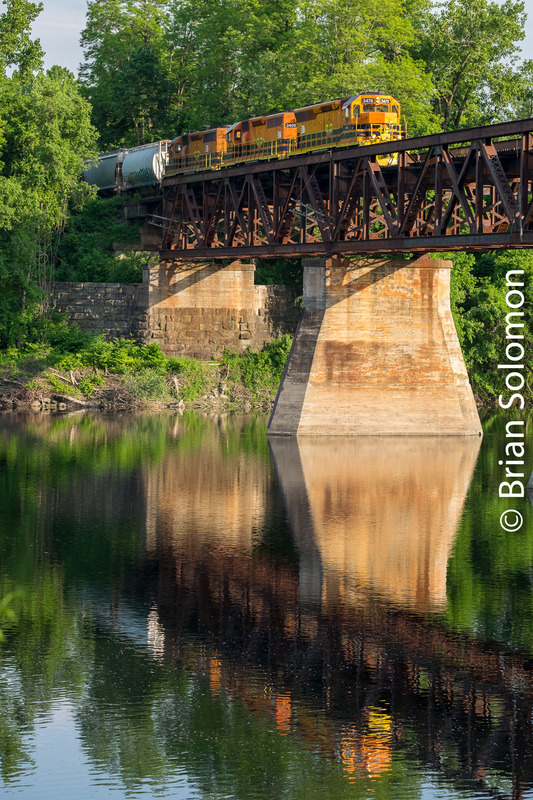 New England Central 611 approaching Brattleboro, Vermont on a causeway across a Connecticut River backwater. Europe’s Most Photogenic Urban Railway? 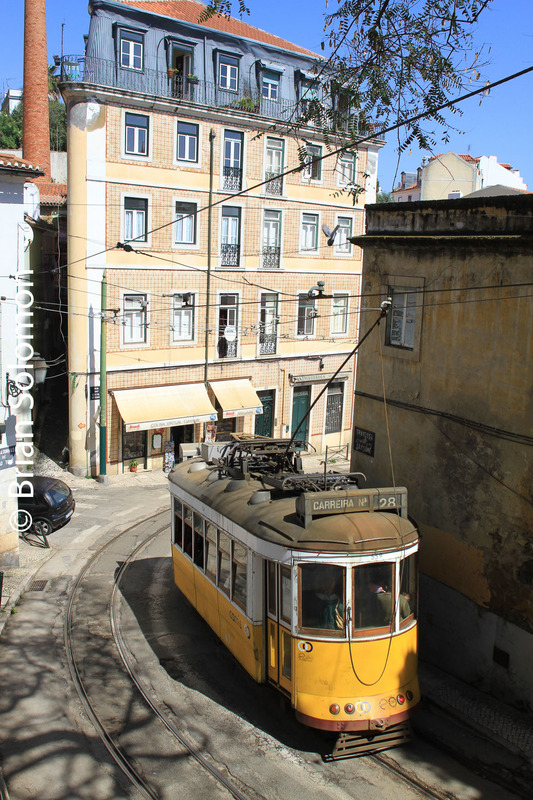 Five Photos—Lisbon Trams. 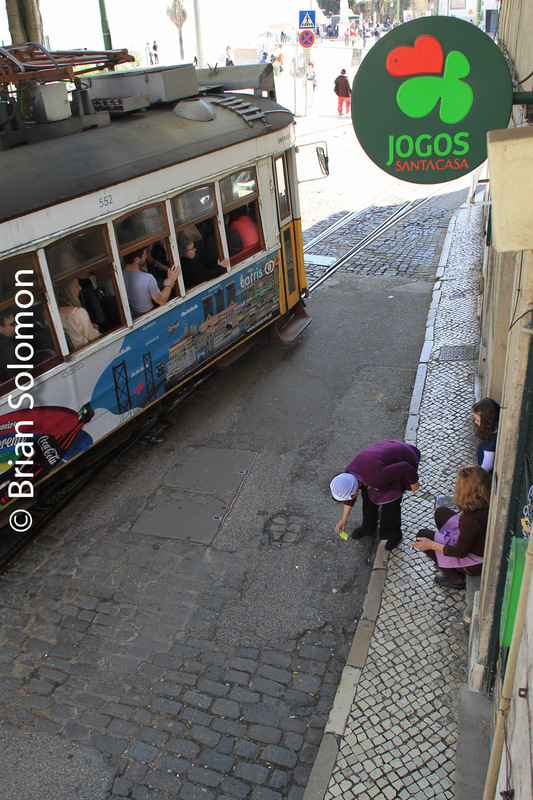 As far as transit is concerned, Lisbon is the San Francisco of Europe. 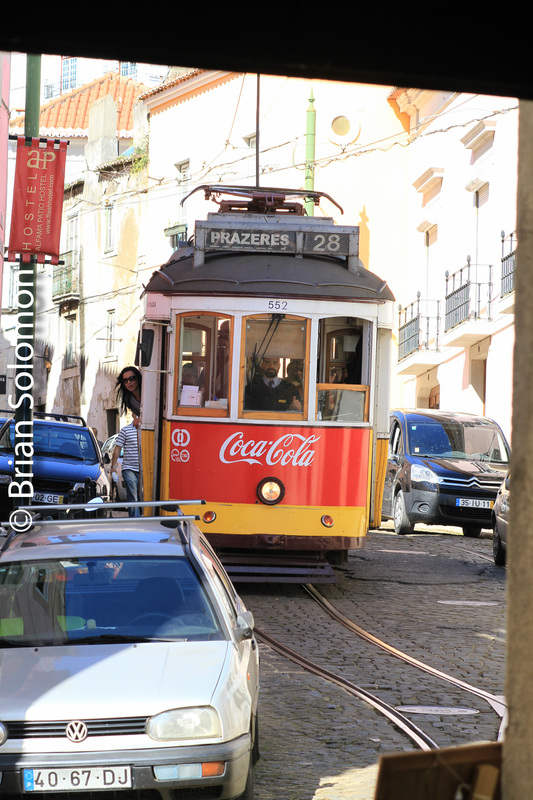 Ok, you can nitpick about the methods of propulsion, cables versus juice, but with steep hills, outstanding urban panoramas and quirky twisting trackage in narrow streets and fully functional antique cars, Lisbon’s tram system has lots in common with San Francisco’s famous cable cars. These cities have lots of parallels too, certainly in layout and appearance, and weather. I made these photos in the Portuguese capital on a brilliant day in April. There’s seemingly endless opportunity for photographs. But do you work with the shadows or in the shadows? Canon EOS 7D digital photo. View from a Portuguese restaurant. Canon EOS 7D digital photo. 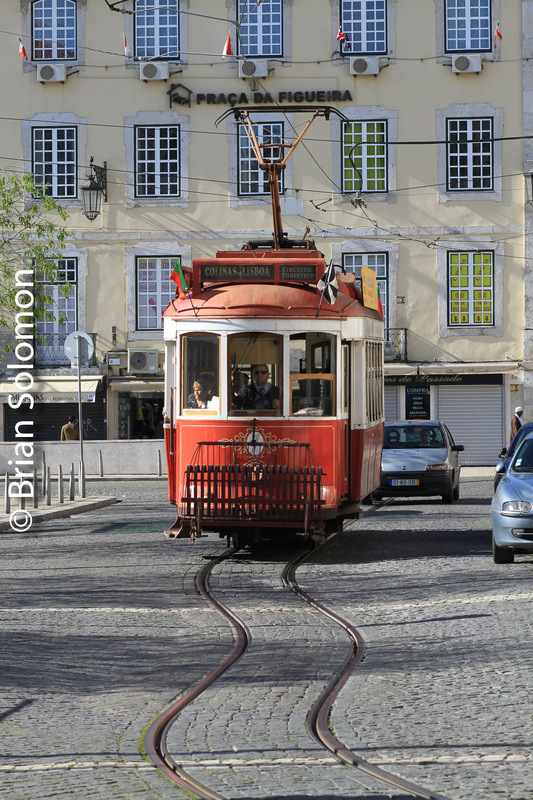 For the tourist, Lisbon’s trams are both transport and an attraction. 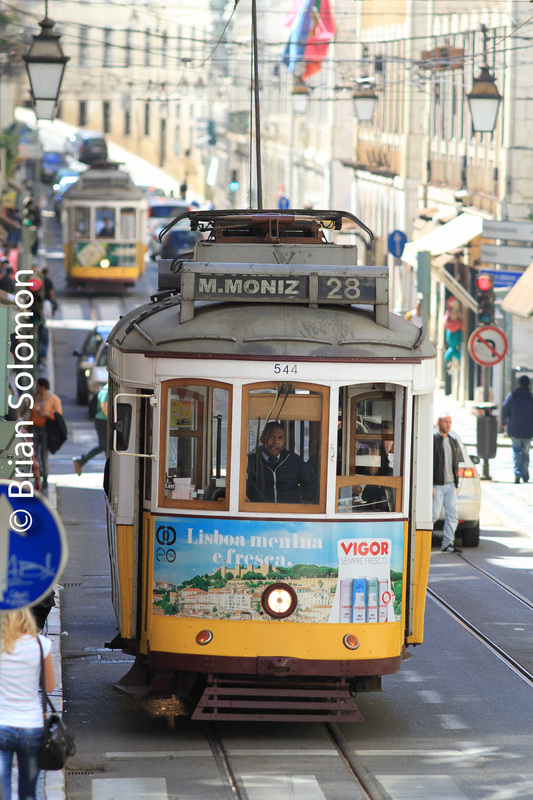 Lisbon is among the cities featured in my new book, Brian Solomon’s Railway Guide to Europe available now from the Kalmbach Hobby Store. You can also get my book on Amazon. If you like what you see, please give me a good review! Thanks! Red trams make a special circuit for visitors. Canon EOS 7D digital photo. 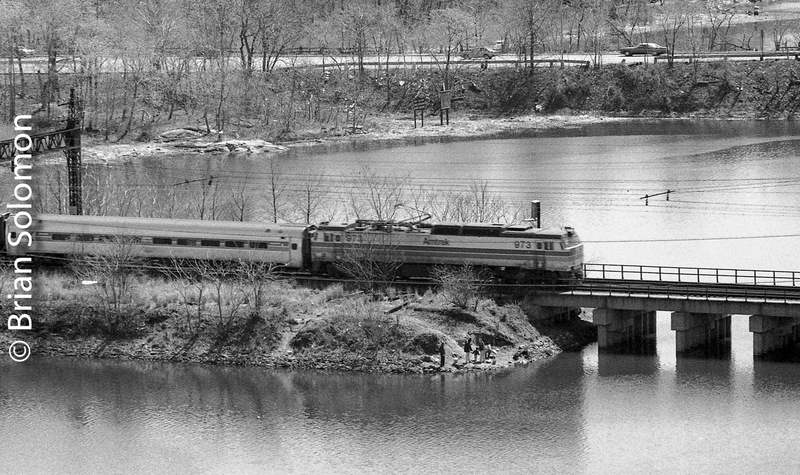 Pan Am Railways crosses the Connecticut; Old and Older and both Blue. I had a late start the other day. 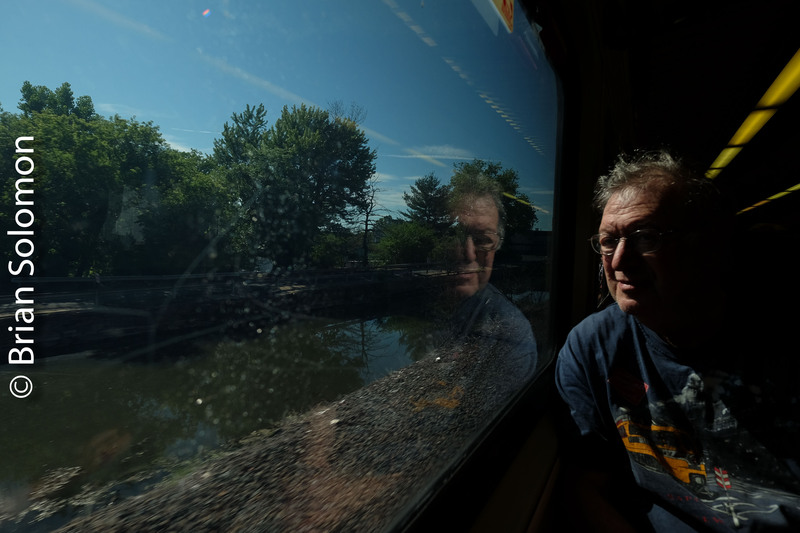 After intercepting Amtrak’s southward Vermonter on the Connecticut River Line, I drove to Pan Am’s East Deerfield yard(near Greenfield, Massachusetts) to see if anything was moving. 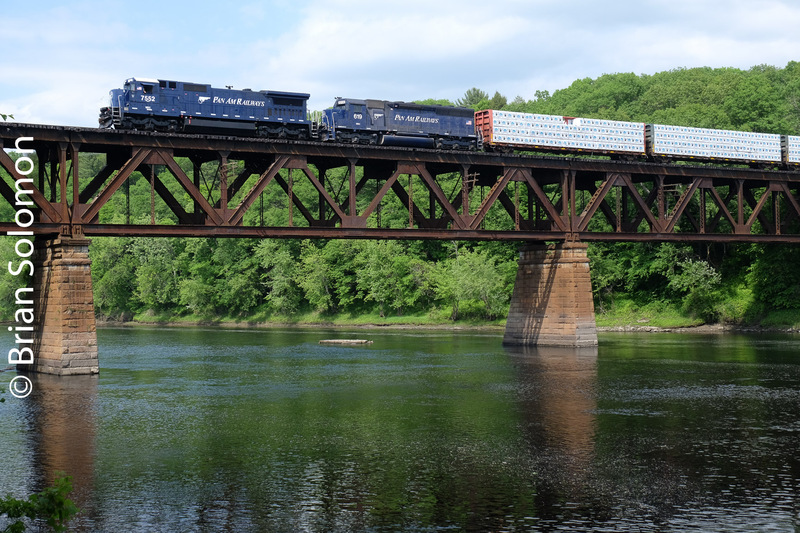 Fortuity and patience combined enabled me to make photos of Pan Am Railways POED crossing the Connecticut River Bridge (immediately east of the yard). In the lead was 7552, one of two (soon to be three) former CSX DASH8-40Cs wearing Pan Am Railways paint, plus one of the railroad’s last remaining 600-series six motor EMDs (619, that began its career as a Southern Pacific SD45) still in traffic. Exposed with my FujiFilm X-T1 with 18-135mm lens. Catching this pair of locomotives together is a coup. I’ve always found transition periods make for interesting photographs; during the last year, these second-hand GE’s have sidelined many of Pan Am’s older locomotives. Will this be the last time I catch one of the 1980s era GEs working together with a 1960s era six-motor EMDs in Pan Am blue paint? 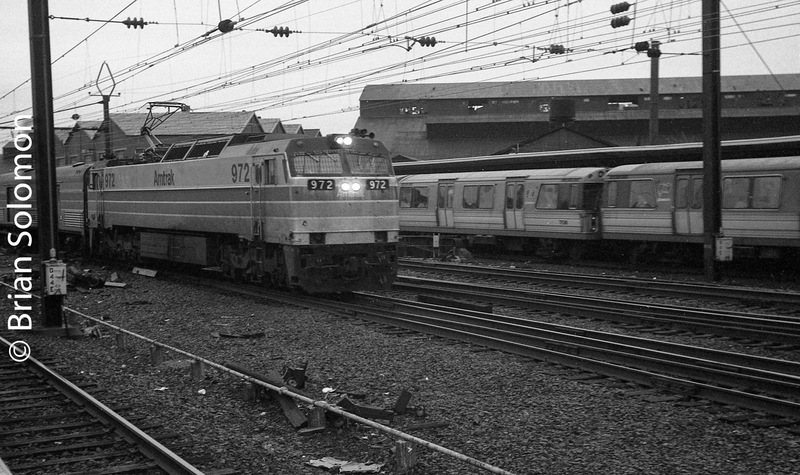 Retrospective in 3 Photos: Amtrak E60s in the Early 1980s. In my early days, picturing former Pennsylvania Railroad GG1 electrics was one of my main photographic interests. I held Amtrak’s newer E60 electrics is disdain. These modern, boxy electrics appeared to be supplanting the GG1s. 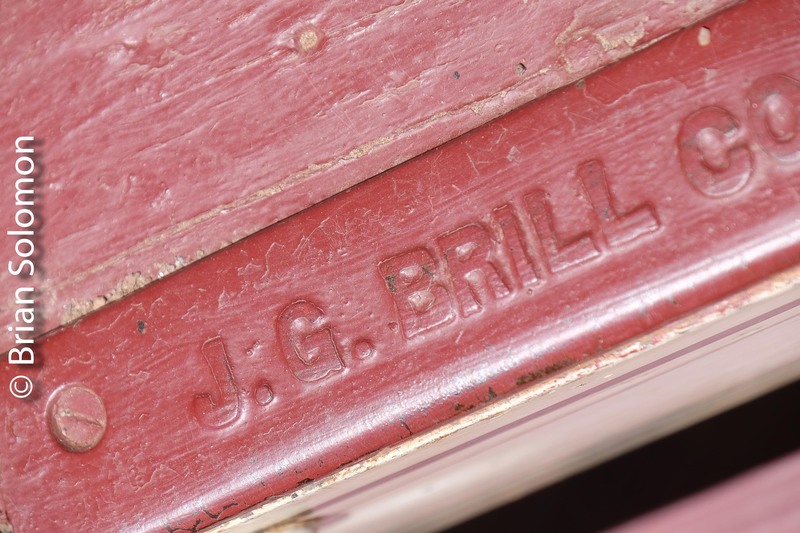 For me they lacked the historic connections, the elegant streamlined style, and the character of the GG1. They were bland and common. I may not have been fond of the E60s. But I always photographed them. They were part of the scene, and important elements of modern operations. Recently I rediscovered these E60 photos along with some other long-missing black & white negatives. 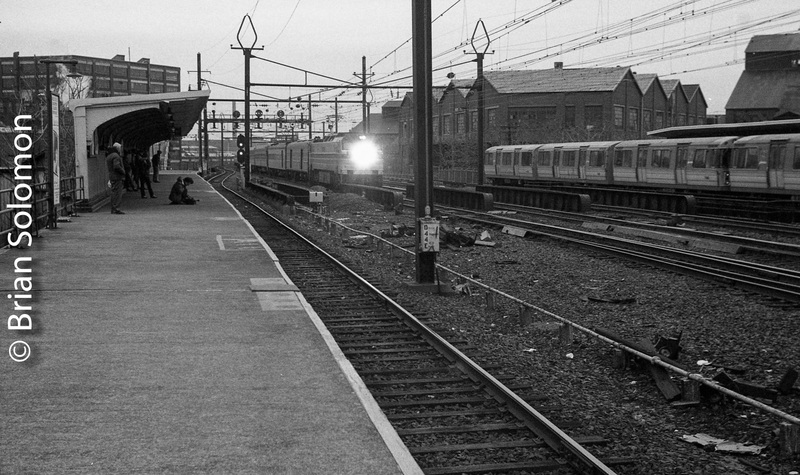 Amtrak E60 972 leads a westward/southward train at the PATH (Husdon & Manhattan) station in Harrison, New Jersey on a gray wintery afternoon in 1981. Kodak Tri-X processed in Microdol-X. The view from my grandparents’ balcony in Co-op City in The Bronx overlooked Amtrak’s former New Haven Railroad Hell Gate Bridge route. I made this view using a Leitz 200mm Telyt telephoto lens attached to a Visoflex reflex viewfinder. Although klutzy, this lens arrangement allowed me to attach the telephoto lens to my Leica 3A. Focusing on moving subjects was a challenge. I made this view hand-held and while I nailed the focus my level was completely off. I corrected the skew in post processing.